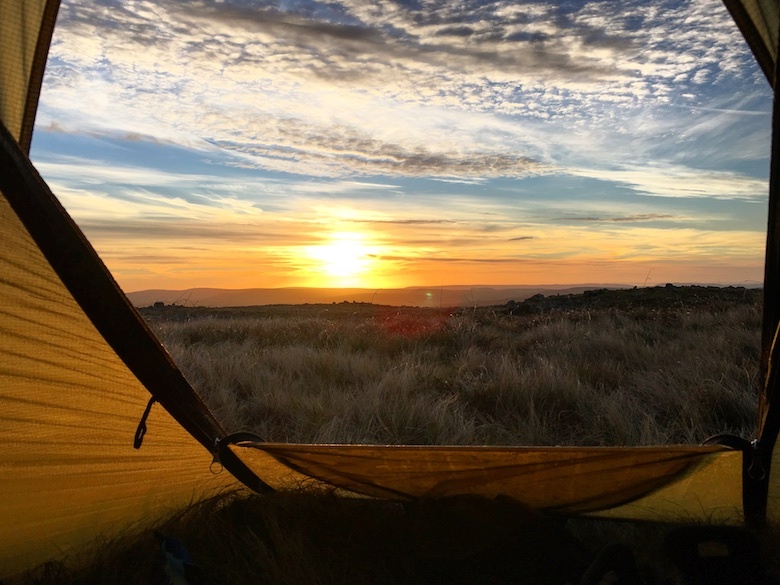 Backpacking in mid November is a lottery where the odds are stacked against you. The forecast for last weekend was not very promising to say the least. The weather map had a big blob of blue over the country with fat wind arrows arriving from the South West. 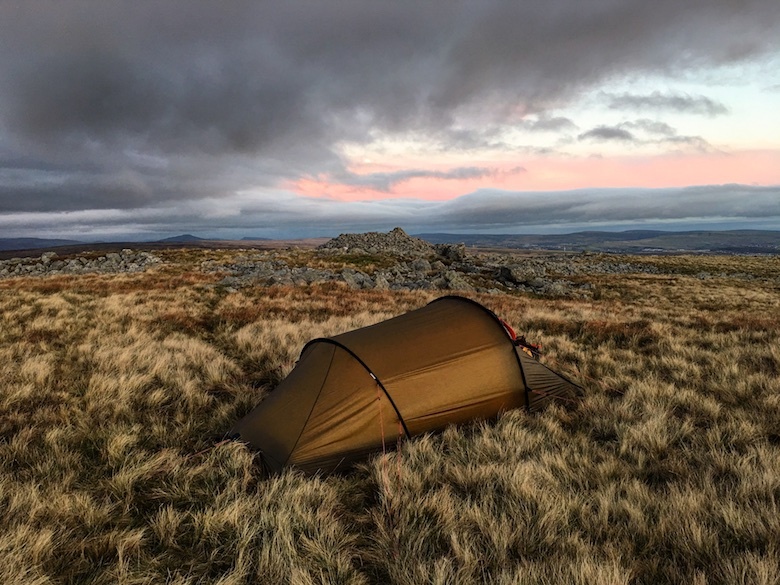 Despite this I just HAD to get out and HAD to wild camp. Sometimes I get an itch that must be scratched. A small patch of Wales sorted the itch out nicely and I came back a happier person with peat stains on my trousers. 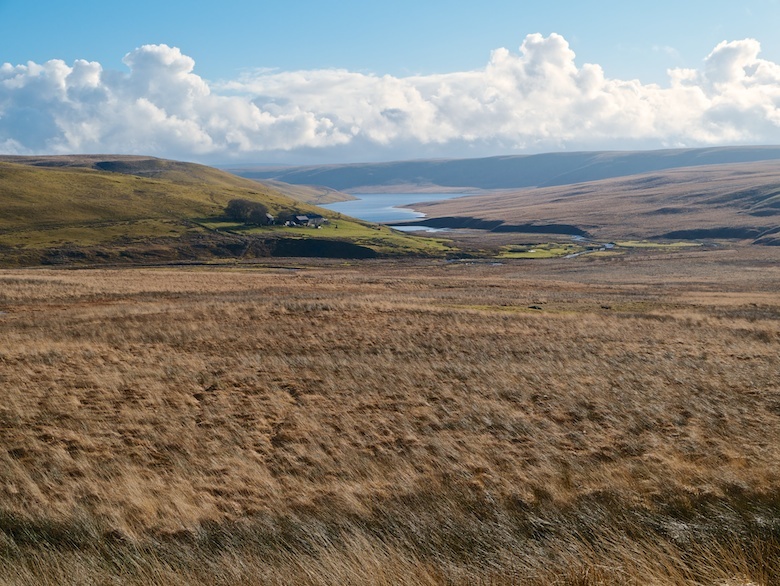 This is a land of contrasts, high distinctive moorland, the fringes scarred by industry. 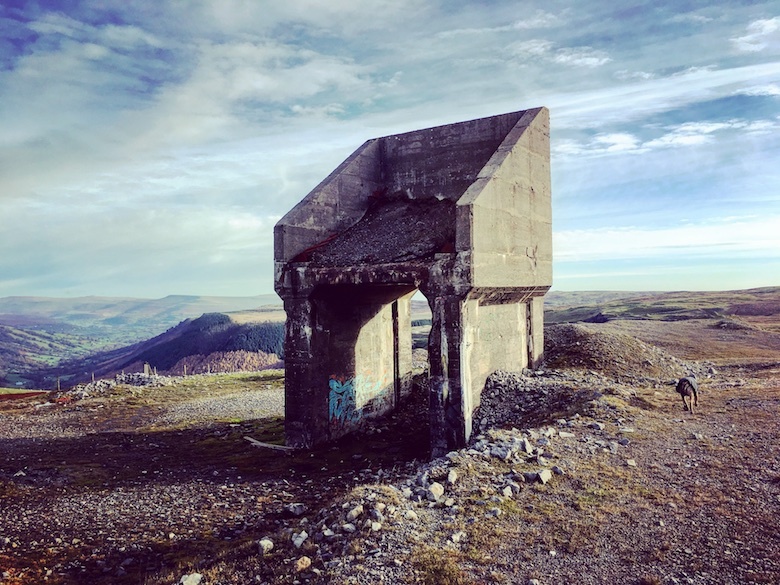 It’s best to take the landscape as it comes, warts and all. 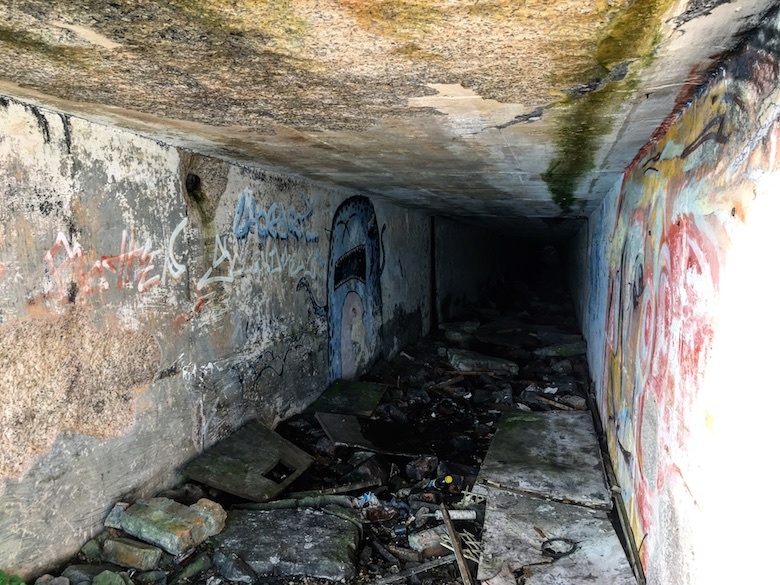 The brutal decay was just as fascinating as the beauty. I have lost my writing jazz at the moment so this trip report will take the form of a few snaps taken on my phone. 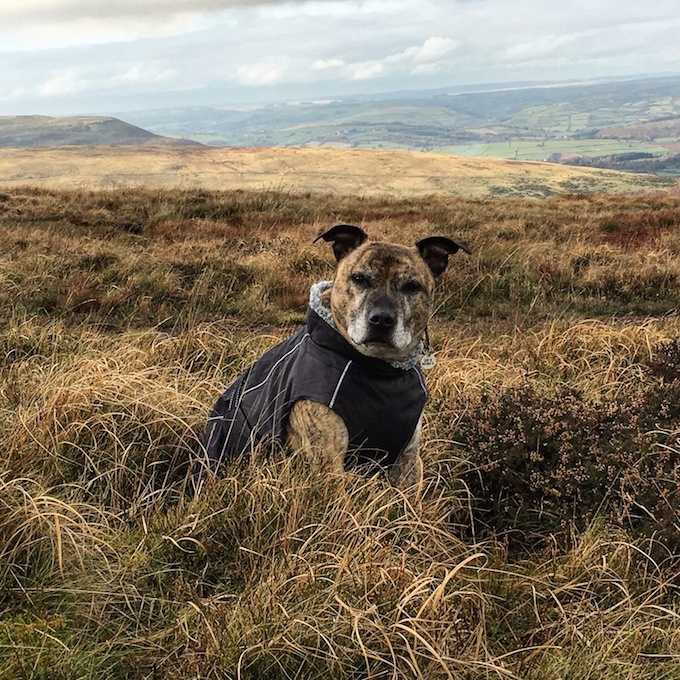 Reuben proved himself to be a good model in this instance, as well as excellent company. I am quickly coming to realise that it is pointless weather watching during the week leading up to a backpack. Each day the forecast changes and you watch in dismay when the promised sunshine is replaced by a weather warning. In the end I took it as an omen that the Lakes should never be visited during the mad season called the School Holidays. 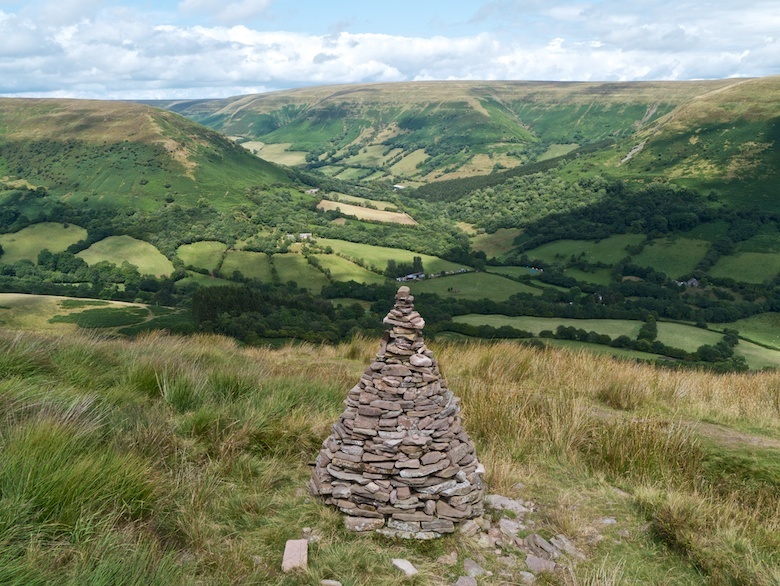 Instead I headed south to the Black Mountains, a promise of sunshine and a much quieter weekend in the hills. 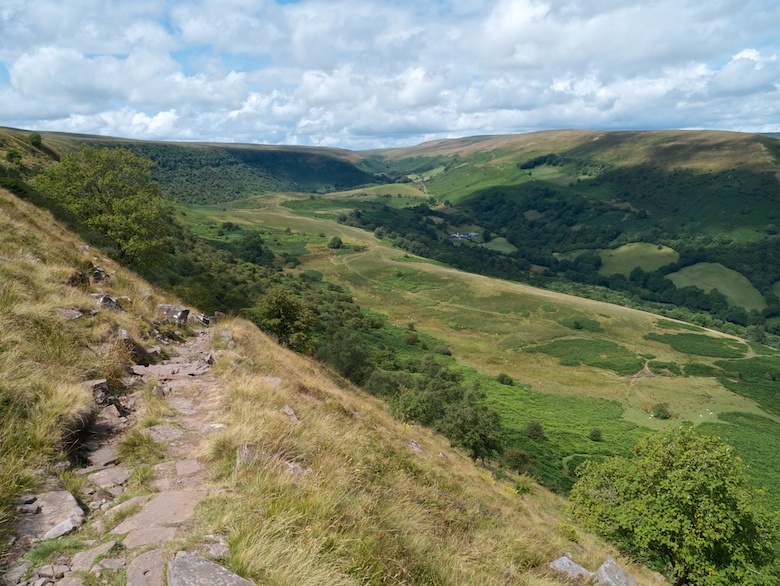 A small car park in the Olchon valley is a superb high level springboard for the narrow ridge that leads to Black Hill. It was a bit of a challenge finding it though the maze of narrow high hedged lanes. As I locked up the car the heavy rain on the journey south had been replaced by shafts of sunshine piercing the heavy brooding clouds. After being cooped up in the car for four hours, Reuben was given his freedom. He was lucky enough to be off lead from the moment he left the car until he got back in it the following afternoon. I’m very happy to say he acted impeccably, remaining within a couple of metres of my side the whole time. 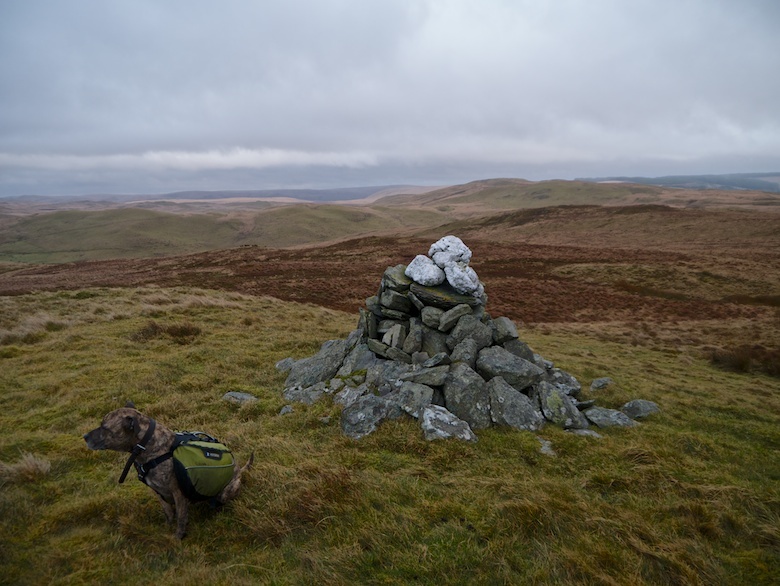 The ridge to Black Hill is a gem. 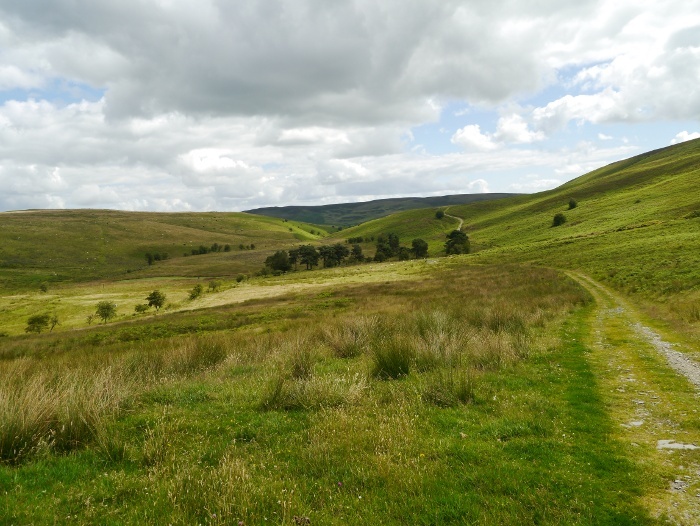 It’s nowhere near knife-edged but contrasts greatly with the surrounding rolling hills. Height was quickly gained, although I frequently had to stop to look at the views. 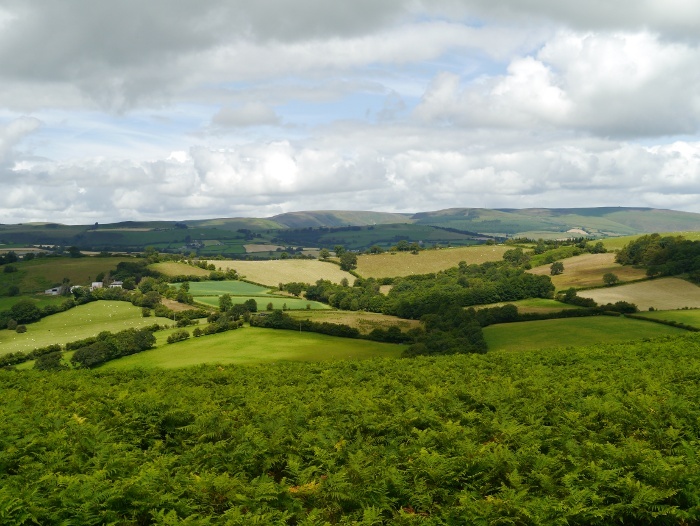 The mountains of Wales finish abruptly and meet the green rolling English countryside. 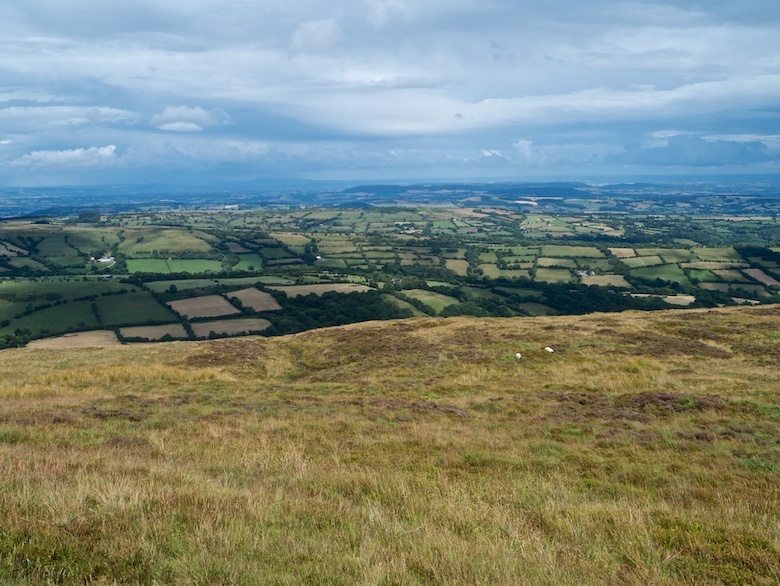 It really is rather beautiful and there is a good feeling of height walking the eastern Black Mountain escarpments. One final shower had me hurriedly pulling on waterproofs which were soon removed again. A warm and windy afternoon followed which made me glad that I had decided not to go to the Lakes. 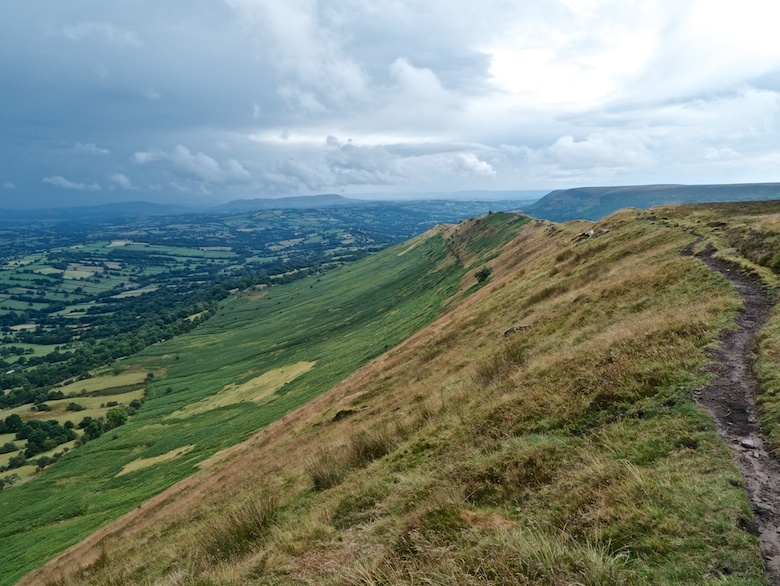 Hay Bluff is a cracking viewpoint and the only section of my route that could be considered busy. The Gospel Pass gives easy access and there were also folk climbing up from the car park directly below. 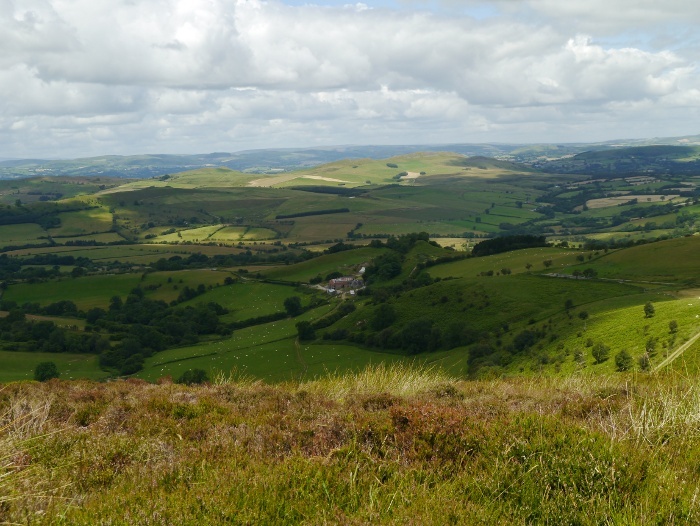 Looking north into the hills of Wales I once again told myself that I will have to at some point put some time aside to walk the Offa’s Dyke Path. 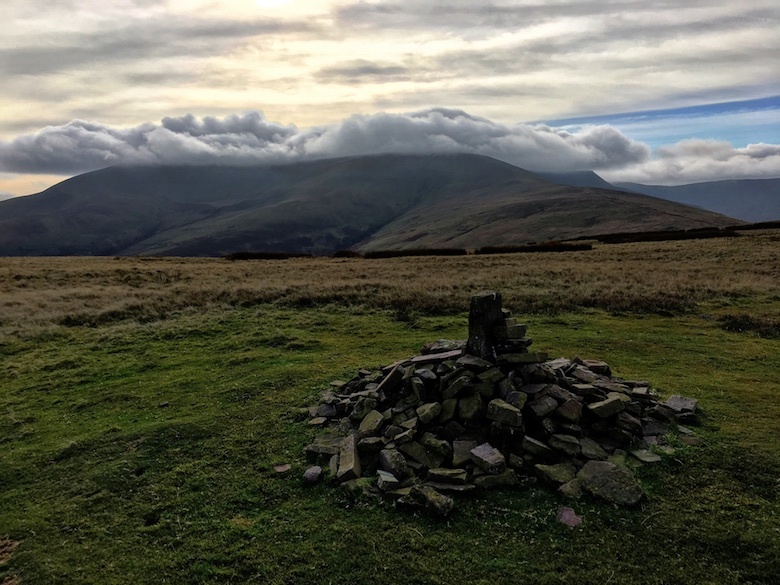 Descending towards the Gospel Pass the scourge of the Brecon Beacons shattered the peace. 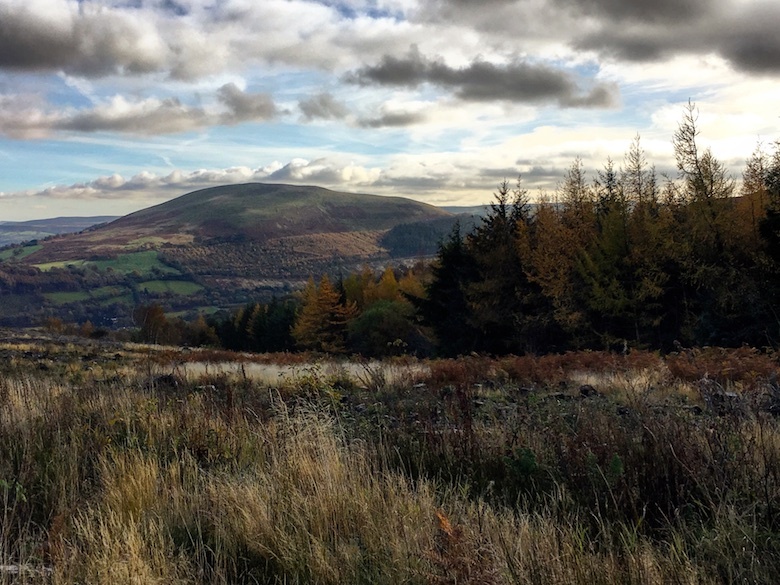 A trio of trail bikes were speeding down the path from Lord Hereford’s Knob. A cloud of dust, the whine of engines and the smell of petrol followed in their wake. Not a good mix with the hikers, families and dogs enjoying the hills. They also churn up the hills as I was soon to see. 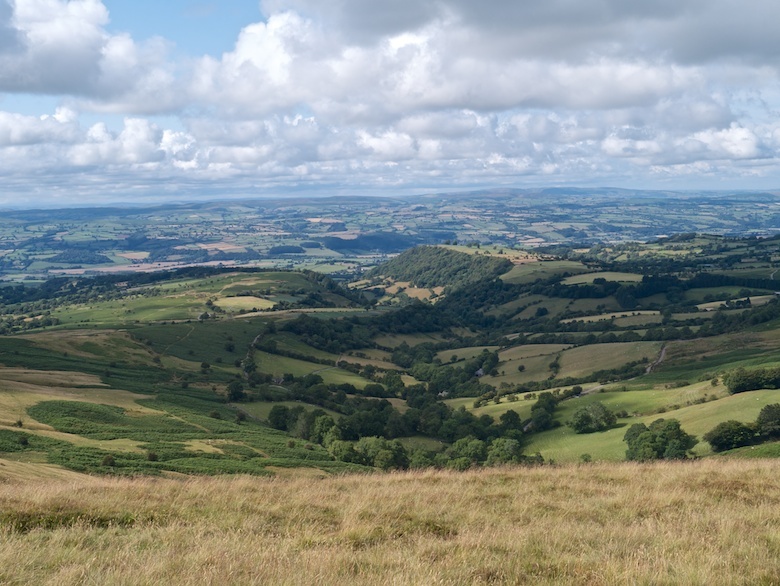 On the summit of Lord Hereford’s Knob (or Twmpa) I found myself humming Half Man Half Biscuit as we sunned ourselves in a sheltered hollow. Thankfully it was a warm and sunny August afternoon on the hill. 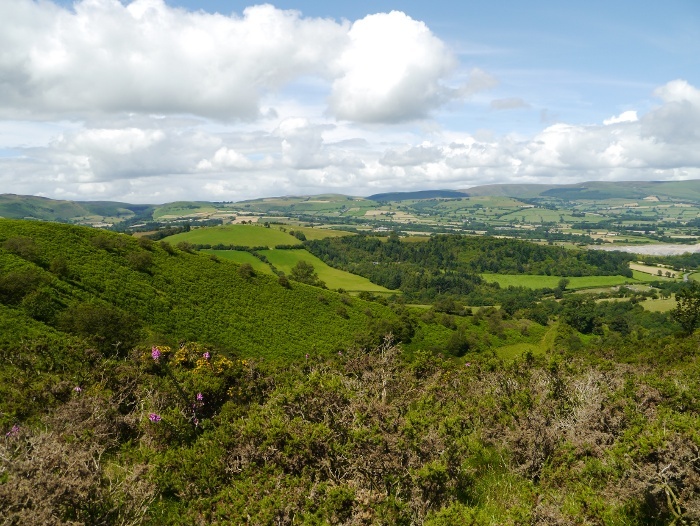 The walk along the escarpment towards Pen Rhos Dirion was a delight in the late afternoon sun. 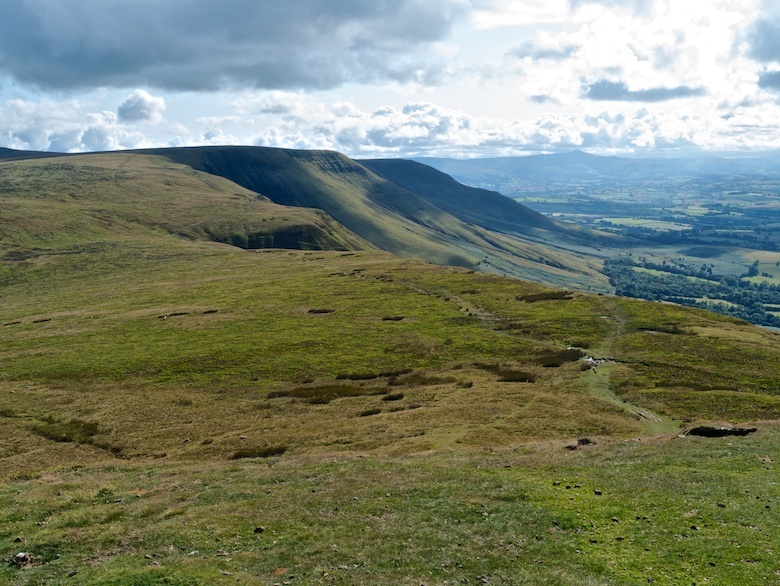 The Brecon Beacons rolled off into the distance, the distinctive summit of Pen y Fan easily identifiable. There were still a few people out enjoying the hills, everyone friendly and happy to be out. 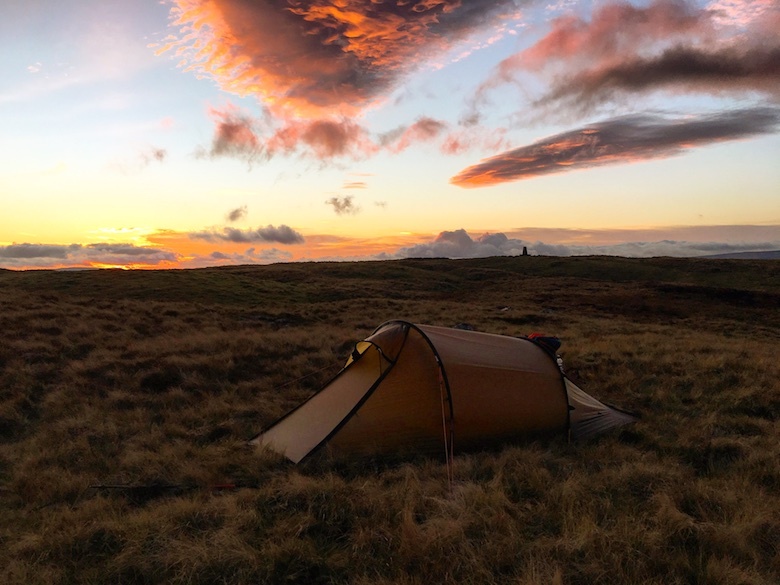 One family was jealous of the fact that I was going to be spending the night pitched high on the hills. I did not envy them that they would soon have to return back to their car and civilisation. Walking on I have to admit that my hackles did rise a bit due to the state of the path, wide and rutted by the passage of many motorbikes. 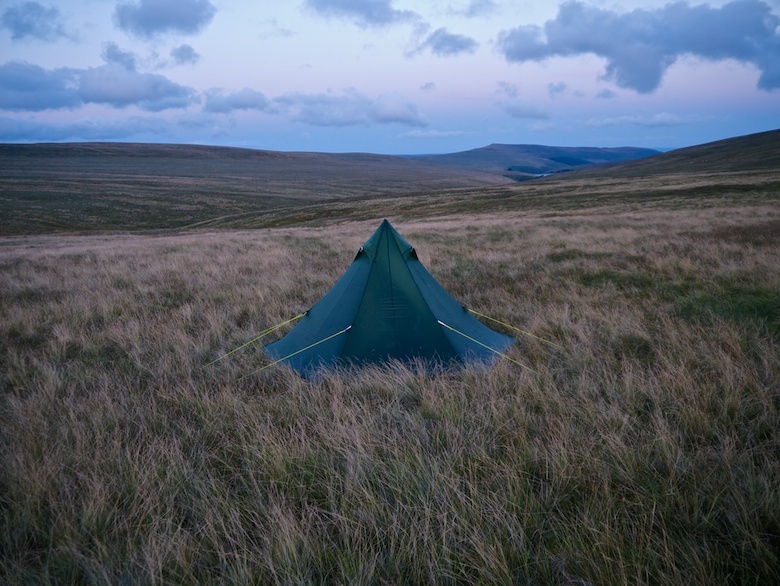 I found an idyllic pitch right at the head of Cwm Cwnstab, so before putting up my shelter I went in search of water. 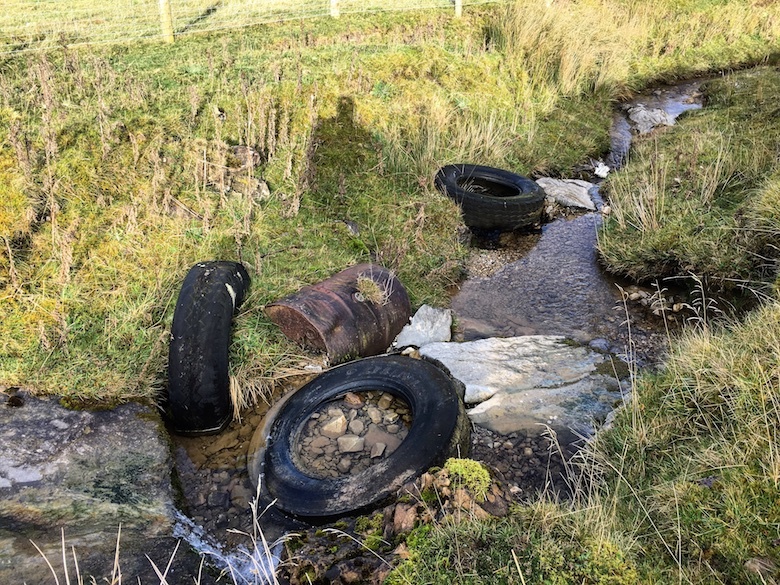 I was pleased when I found a tiny trickle but less than impressed when right next to it I discovered a turd and piece of toilet paper. Instead I moved on wishing the culprit a slow and horrible bowel related death. 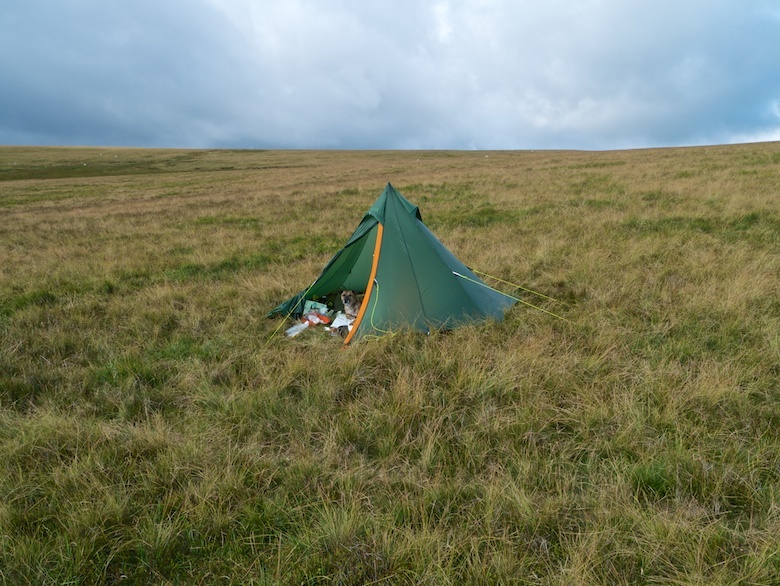 In the end I settled on a substandard pitch on the moors above Grwyne Fawr, hidden from sight from anyone using the track. It was only during the night when I discovered just how substandard it was. 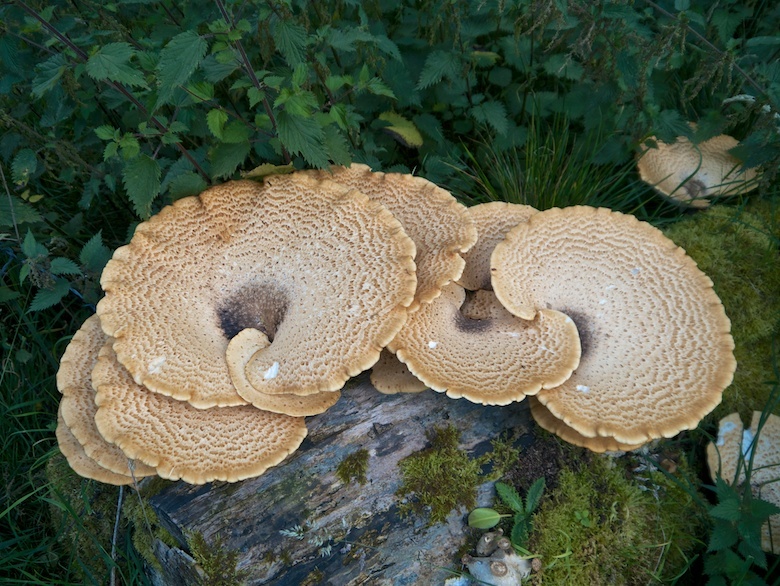 It was both lumpy and on a slope. 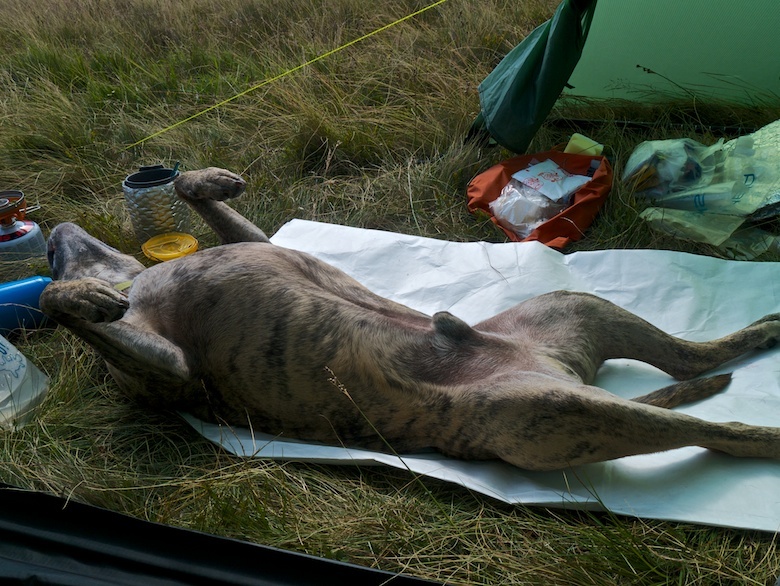 I had put some silicone on my groundsheet to stop my mat slipping off. This worked. However it did not stop me sliding off my mat. Every time I adjusted my position I could feel gravity slowly exerting its force. It felt like a long night. I had plenty of time during the night to ponder the importance of selecting a good pitch. Reuben had no such troubles, curled up on his mat he snored the night away. When we got up we surprised a nearby group with their long hair and long faces. I don’t think it had crossed their minds that a man and dog would emerge from the pyramid pitched in the middle of the moor. The whole family stood there in a line watching us, Reuben providing the most interest. If we moved then dad would rush to the front of the group and flex his muscles before they all backed up and reformed in a line. Mum had lovely long blonde hair which nearly reached the ground. It was awkward performing my morning ablutions in front of them but they did not appear too bothered by that. 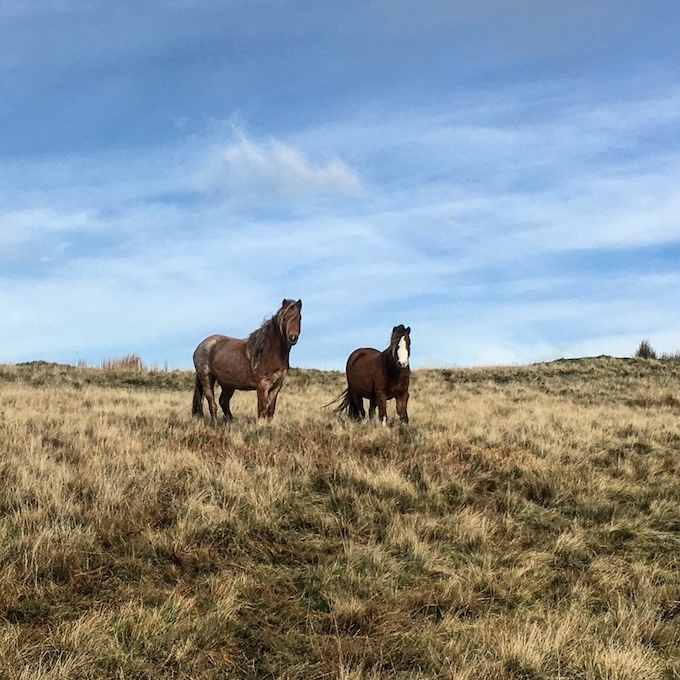 Leaving the Welsh Mountain ponies behind we retraced our route back to the track. 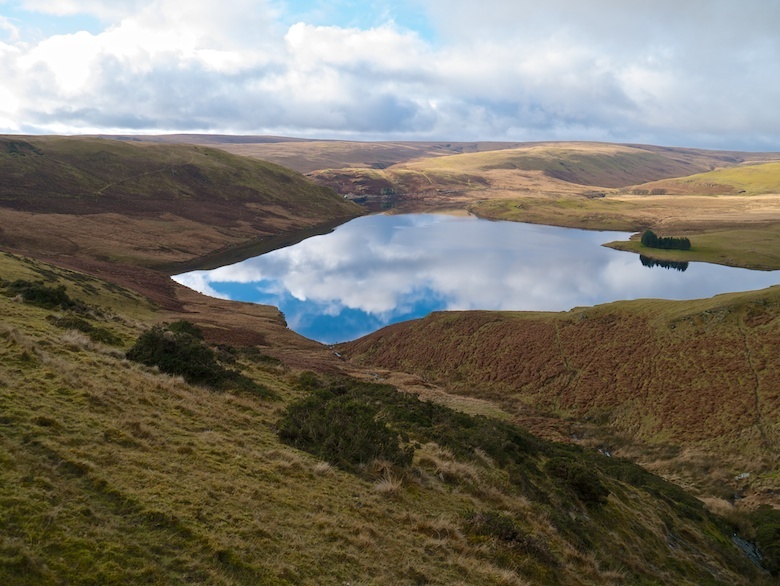 This quickly led us to the Grwyne Fawr reservoir and typically I spotted loads of idyllic looking camping spots along the way. I was tempted to pop down to the tiny bothy but really could not be bothered to bash a way through the tall bracken. Having visited a few times in the past it’s not one that I would be interested in staying in unless in a real emergency. It’s far too accessible and small. 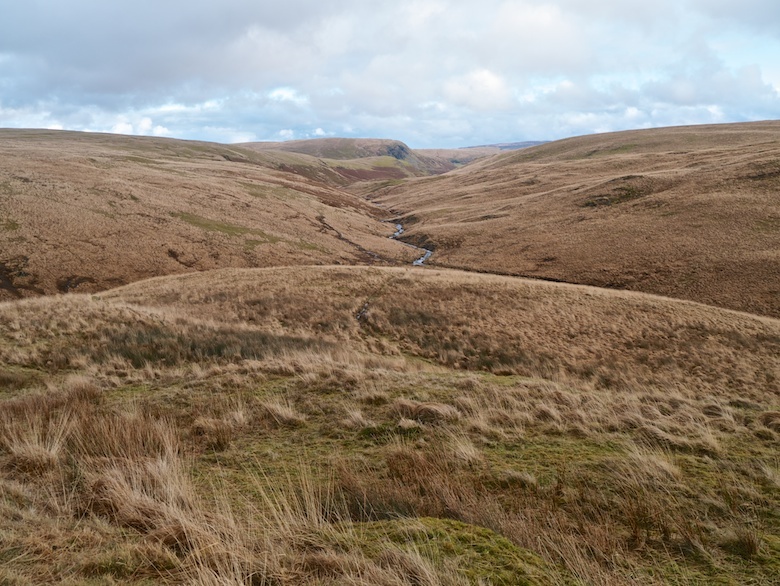 After the relatively easy stroll the day before, I now had the challenge of crossing the grain of the Vale of Ewyas. 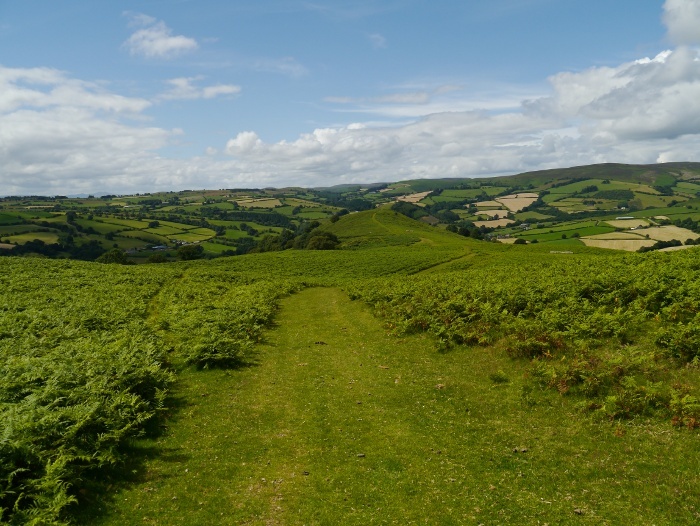 This first involved a climb up to the intervening ridge, a long descent to Capel-y-ffin, followed by a bracken dominated climb to reach the Offa’s Dyke path on the border ridge. 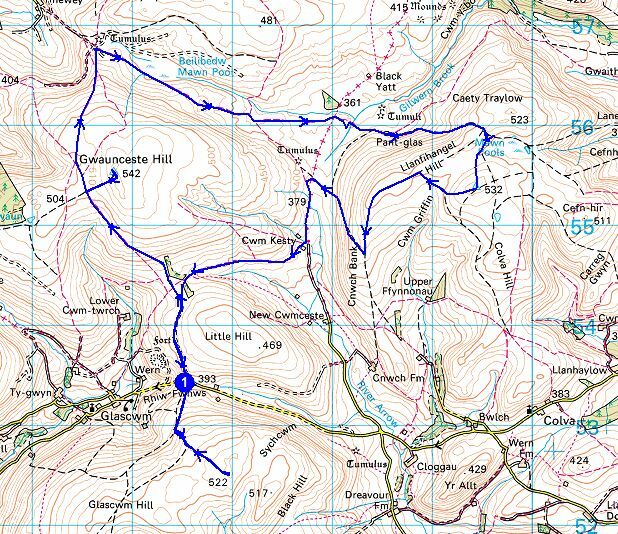 The route was stunning, the vale a myriad of greens and the general buzz of summer. 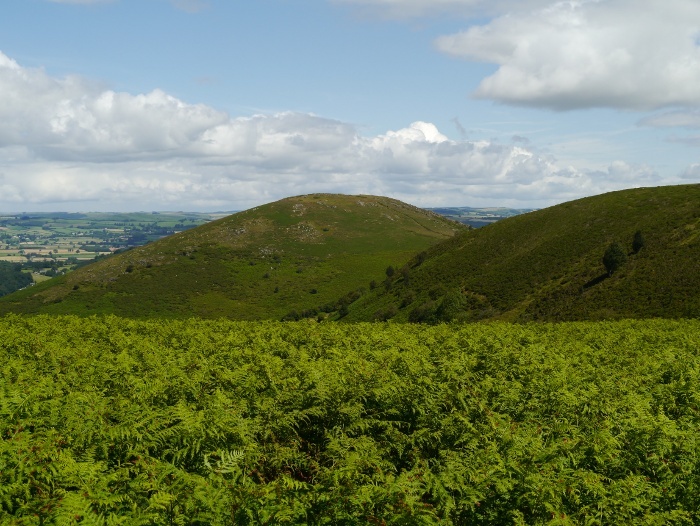 The only downside was that much of it involved bashing through various tunnels of bracken. 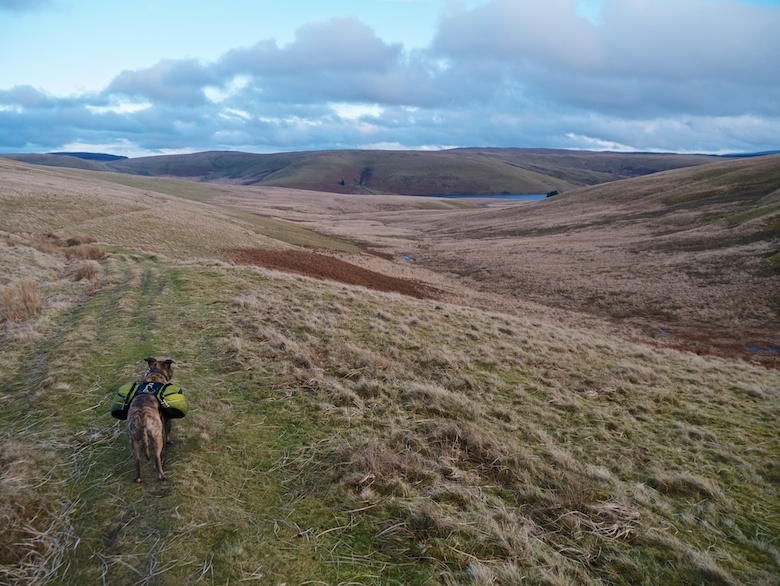 Half of the time I only knew that Reuben was there due to him banging into the back of my legs with his pack. I think he was glad of the shade from the summer sun though. 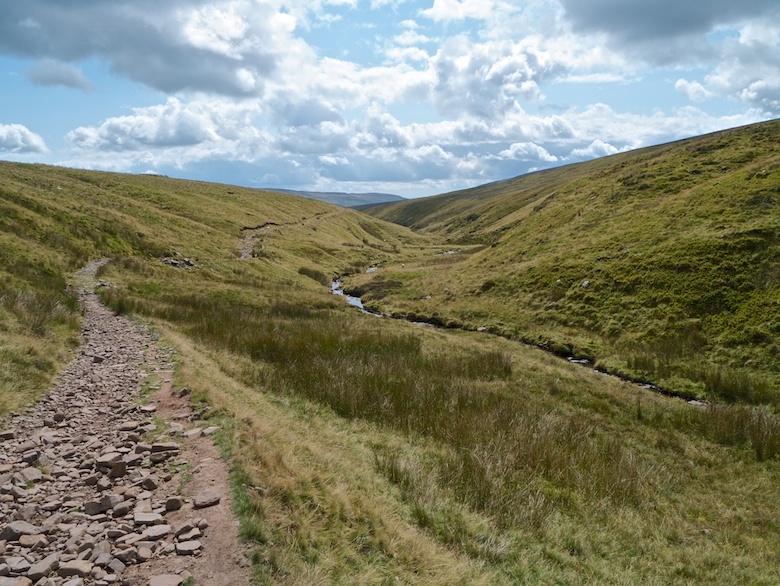 There was one more long descent, this time down into the Olchon Valley. On the way I found a spring gushing with the coldest, tastiest water imaginable. I drank until my throat was numb and wetted my cap to cool my head. A lofty perch was found to sit and eat the rest of my food and take in the extensive views. 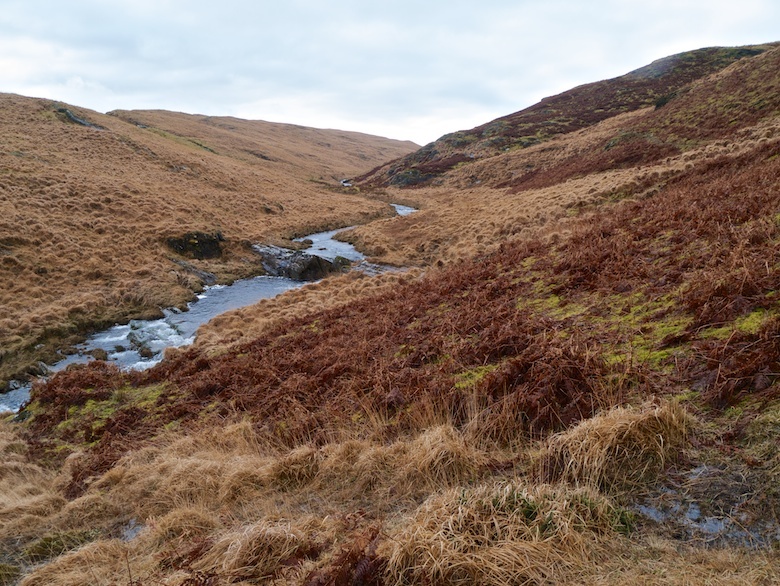 We were once more descending through bracken and into the depths of the valley. It’s a quiet hidden place and I enjoyed the stroll through the fields and woods. 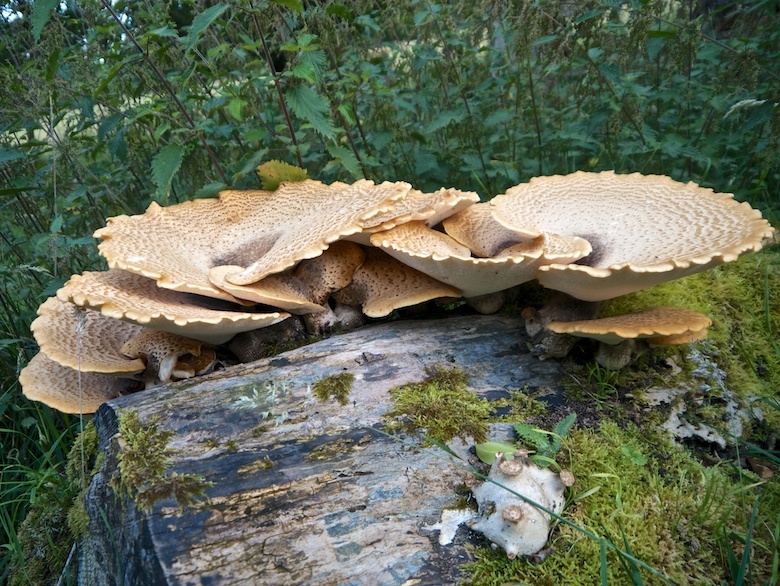 There was some impressive fungi growing from a dead tree near the river. The handily located car park which I left the previous day was not so handy on the final climb of the day. 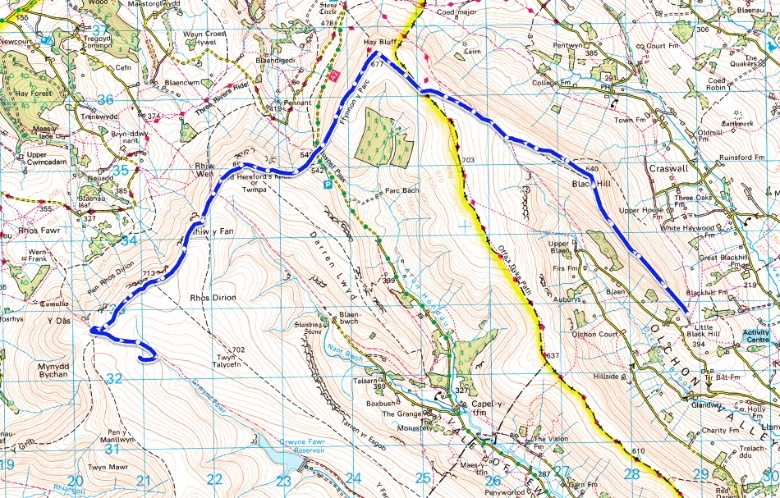 The contours had not seemed very significant when I had been hurriedly throwing together the route. It was good to get back to the car and get my steaming boots off. Reuben quickly fell asleep on the backseat and provided no input on the drive home. By the fourth day the only people who I had seen were a couple on a quad bike. The mind starts playing games under these circumstances and I began to wonder if the apocalypse had finally arrived. 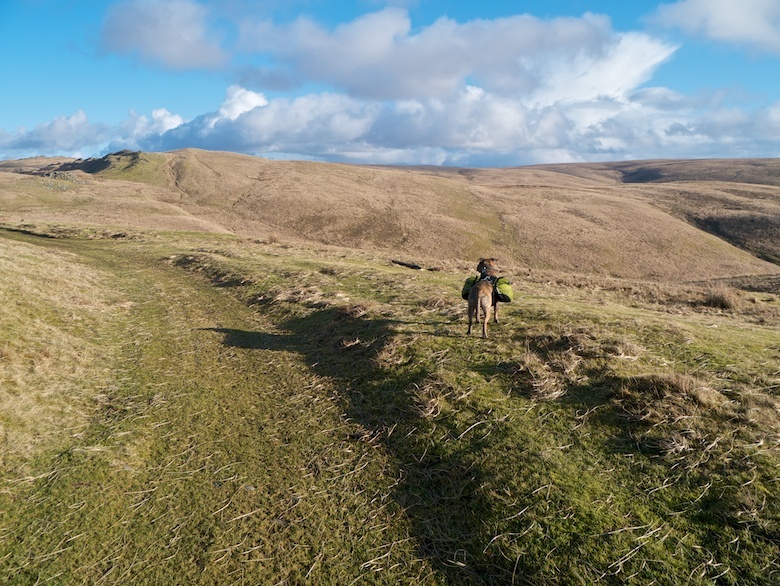 If your idea of a tough backpack involves the manicured paths of the Lake District with its attendant hoards, I advise that you leave this part of Mid-Wales well alone. 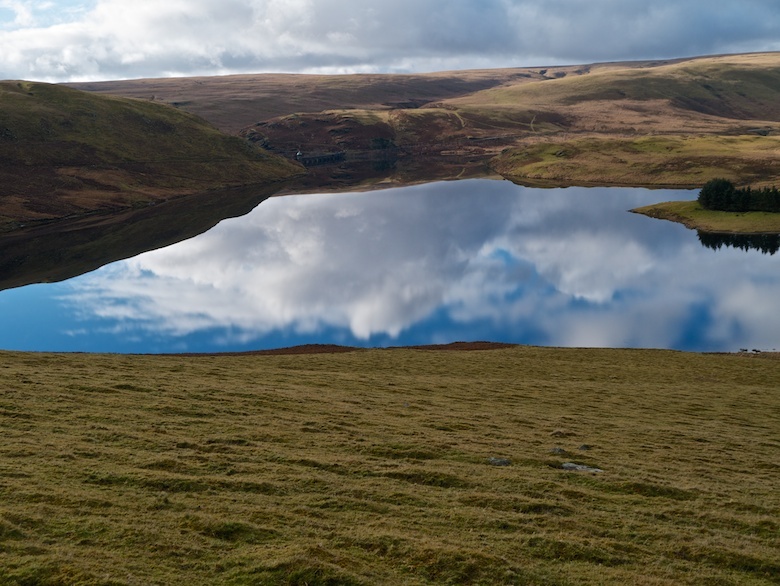 However if you regularly backpack with a snorkel and flippers and have the resolve to be truly alone, pop on down to these lonely moors. To ensure that they are at their wettest come in winter when the days are also at their shortest. You can be as miserable as you want and no one will know. 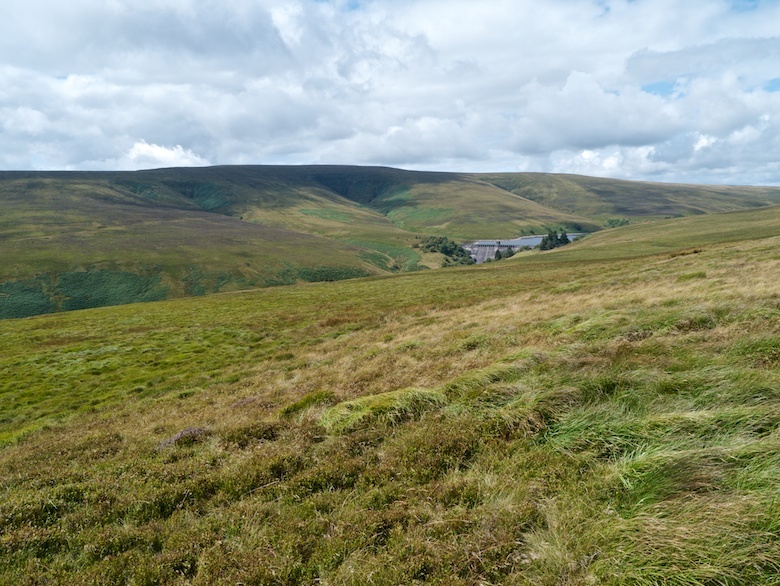 The car park below the Claerwen dam size wise would not look out of place outside Sheffield’s Meadowhall. There was only one other car there when I arrived. Even on the hottest bank holiday weekend I can’t imagine it ever getting busy enough to fill up. 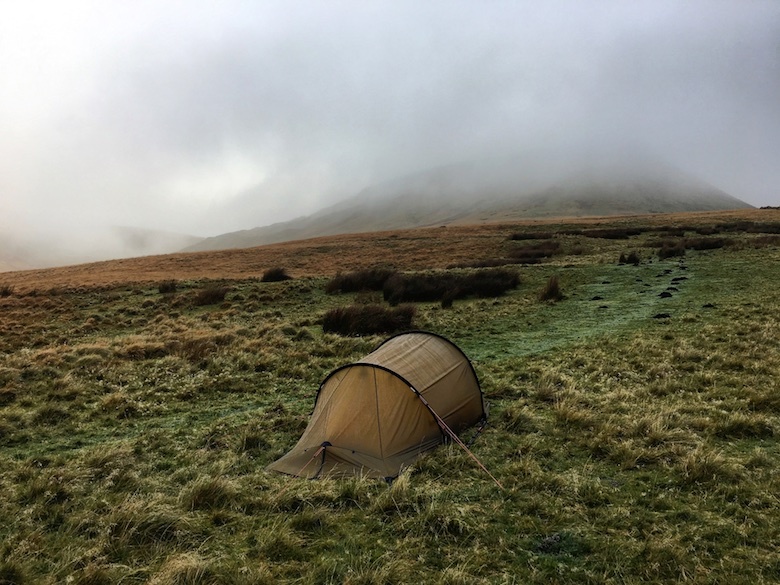 With myself and Reuben sporting packs with enough food and clothing for four days we set off up the bridleway alongside the Afon Arban. There is nothing more irritating than within minutes of setting off you find yourself arse down on soggy ground. A wet boulder and my boots provided zero friction. Therefore my feet shot off from under me like a cartoon character slipping on a banana. Reuben paid no attention to my sorry state as he was too busy eating sheep poo. 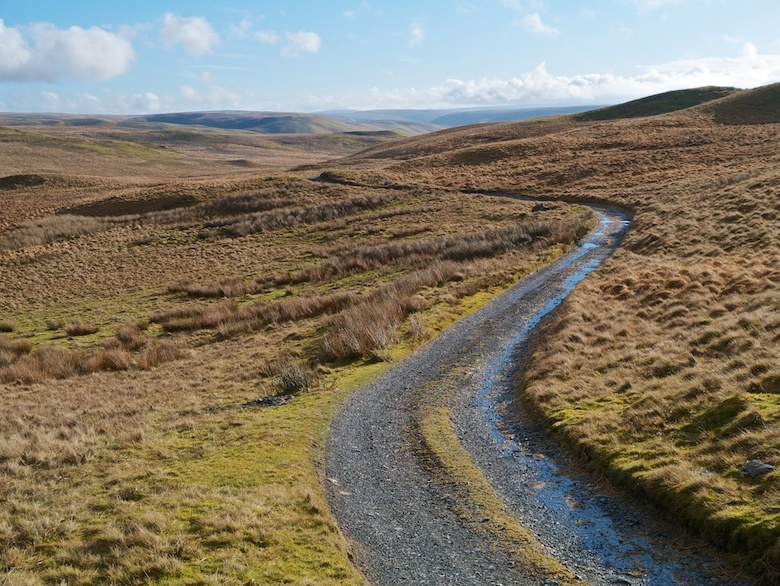 The bridleway up the Afon Arban soon becomes little more than the fantasy of the map makers. 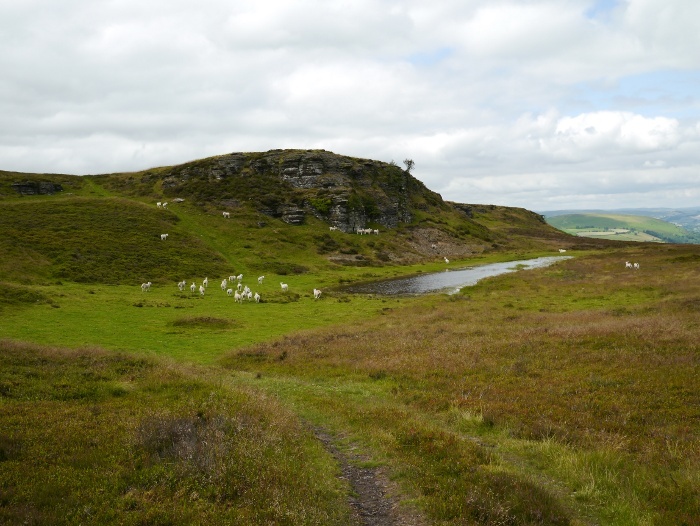 However by contouring along the hillside a series of sheep trods led easily up the valley, avoiding the worst of the bog and tussocks. Towards the headwaters a well-defined quad bike track led the way across a reasonably well-drained ridge. We arrived at the edge of the forest with minimum fuss. I was feeling rather pleased with myself with how we had so far managed to avoid being swallowed whole by a man eating bog. 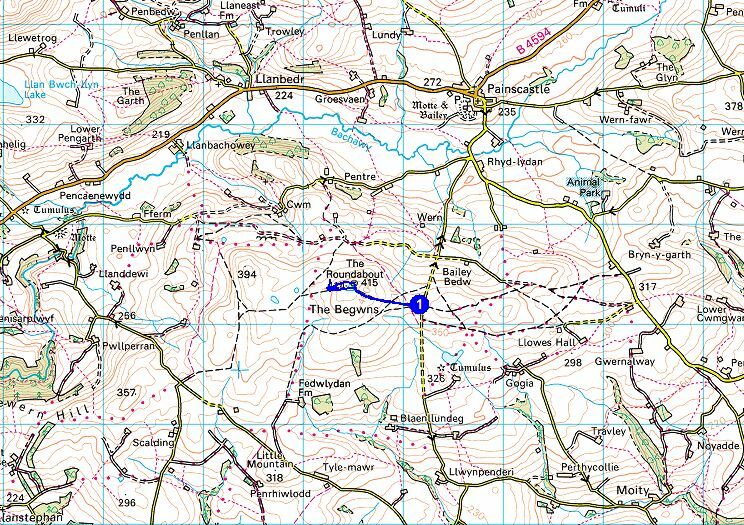 At the point where the bridleway meets the forest on the map there is simply a fence topped by barbed wire. 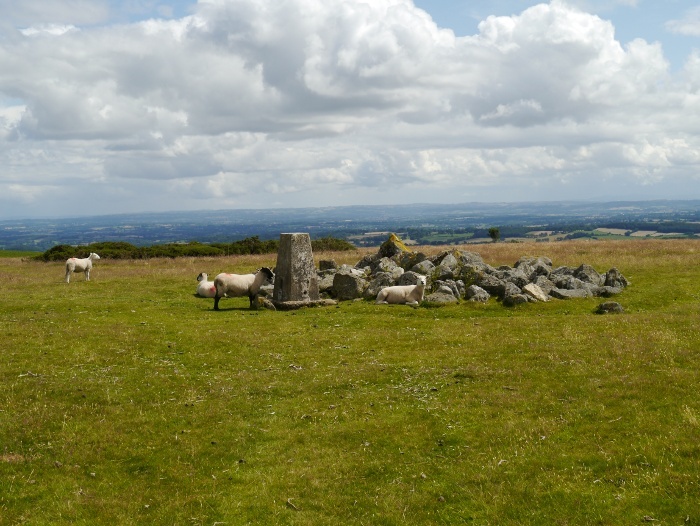 Thankfully I had done a bit of research before setting off on Geograph and discovered that there was a gate a few hundred metres to the north. This led to a boggy ride through the forest, no sign of a bridleway at all on the ground. I was glad when we finally reached the security of a forest track which we followed south for a couple of kilometres. 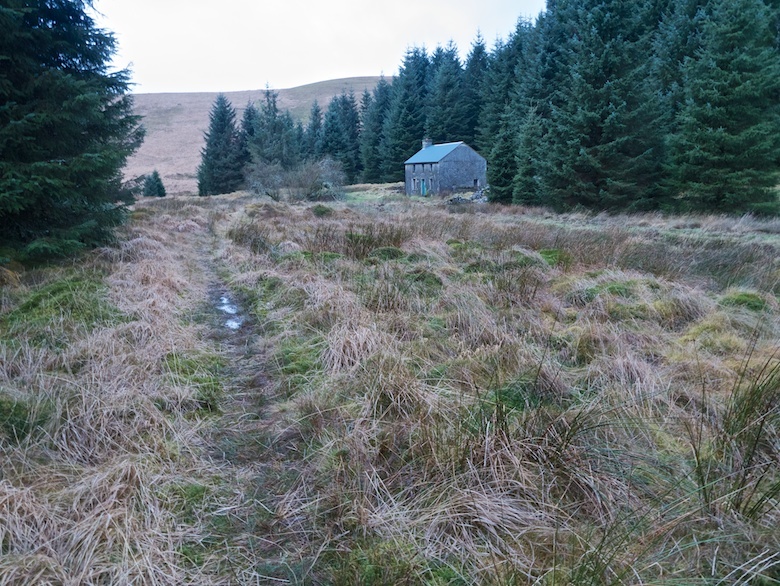 The marked bridleway to the bothy also did not exist on the ground. I had been here before and found the hidden path that descends to the river though the trees. It was eerie in their confines with mist drifting though the branches, the air becoming colder as we descended. 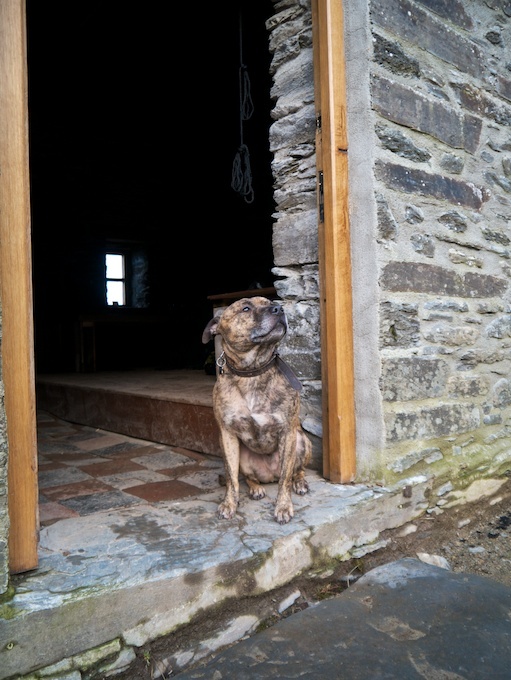 I had the usual sense of trepidation as we approached the bothy. Who would be there and what would they be like? However as we got closer to the building it became evident that no one was in residence. 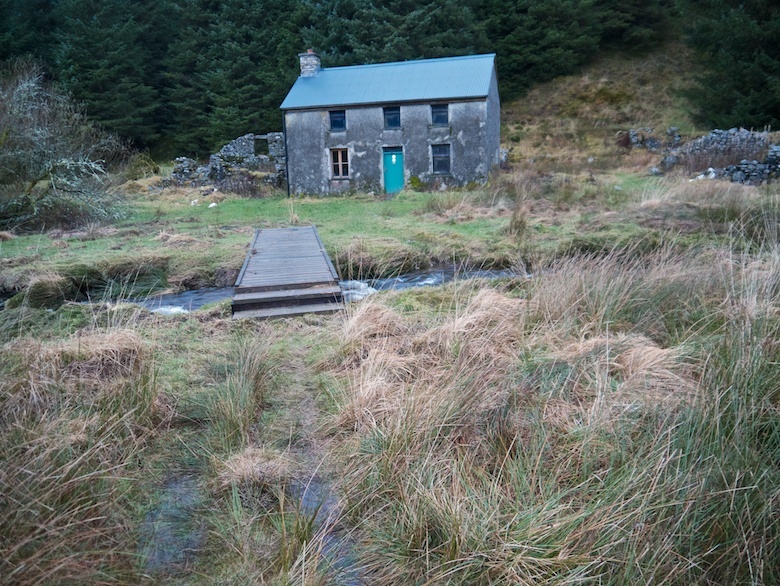 This is probably the remotest and certainly the most difficult of all the Welsh bothies to reach on foot. 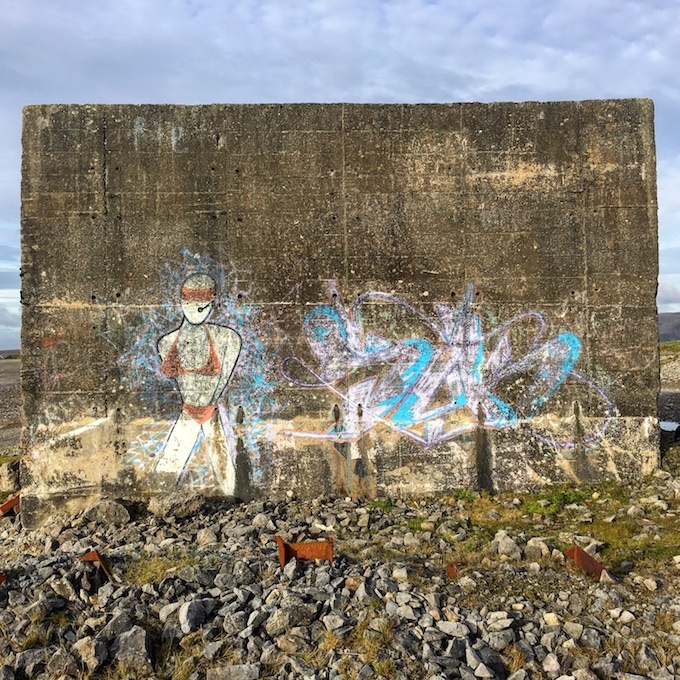 A quick read through the bothy book confirmed that although well used it is not visited by the bothy vandals or party goers. There had been no entries in the book so far this year, almost three weeks. I sorted my gear, fetched water and then spent a couple of hours sawing rather wet wood. Thankfully I had brought in some kindling and fire lighters with me. Therefore with darkness falling a fire was soon blazing within the stove. With boots already saturated I was very glad I had brought along a pair of down slippers. 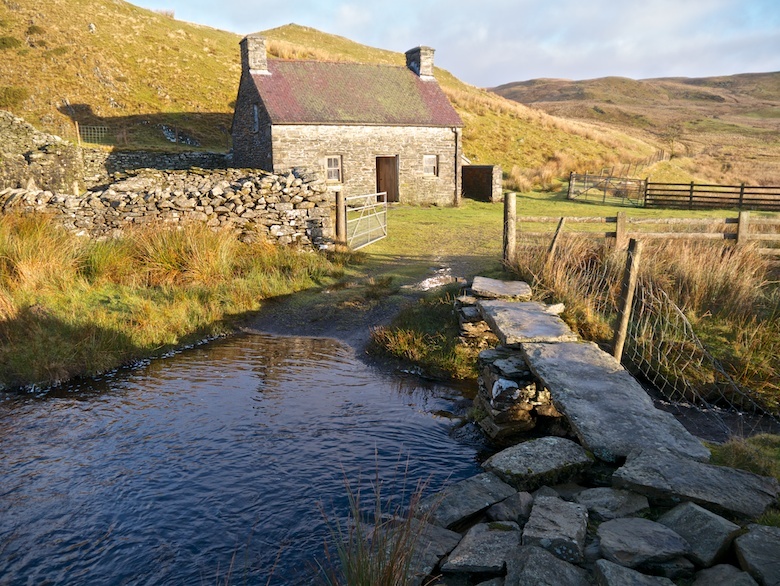 Bothy luxury. At one point the fire was so hot that the temperature in the room raised from 5C to 7C, so tropical that I could barely see my breath anymore! 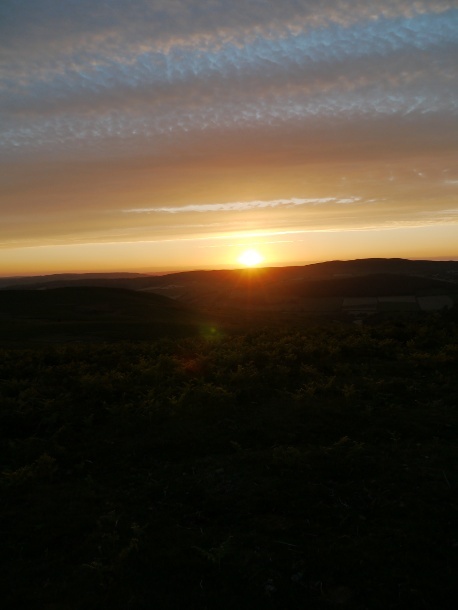 I had a moment of alarm at around 9.00pm when whilst popping out for the loo I spotted headlights coming up the valley. 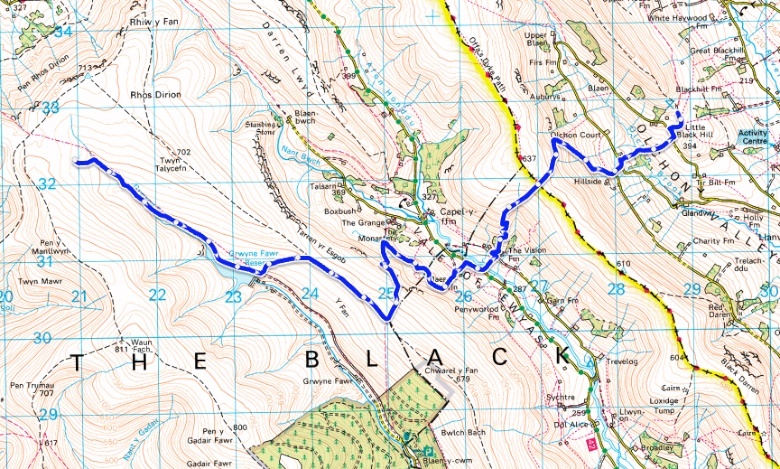 There is a knackered Byeway open to all traffic that runs quite close to the bothy. Along it I could see three 4X4’s slowly moving. I therefore feared that I was just about to be invaded by a large group. Thankfully they soon disappeared and I spent a long but uneventful night with just the dog for company. Rain had come by the early hours as promised and it looked totally miserable outside. 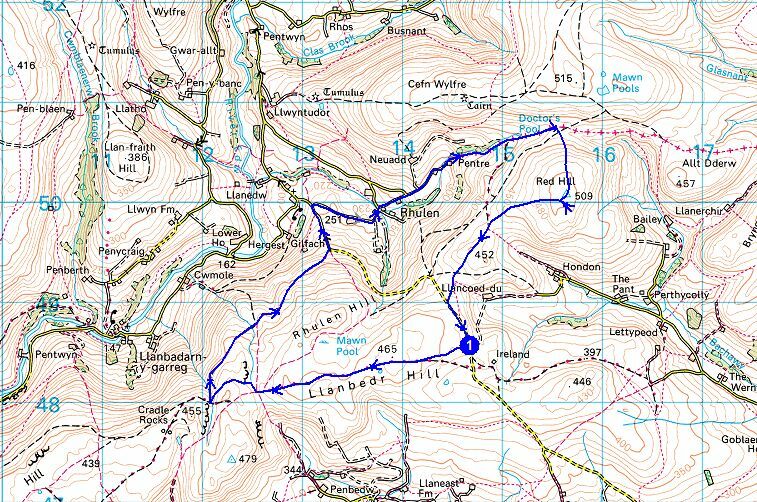 I knew the weather was going to be less than favourable so had planned the first full day of the backpack to be short. 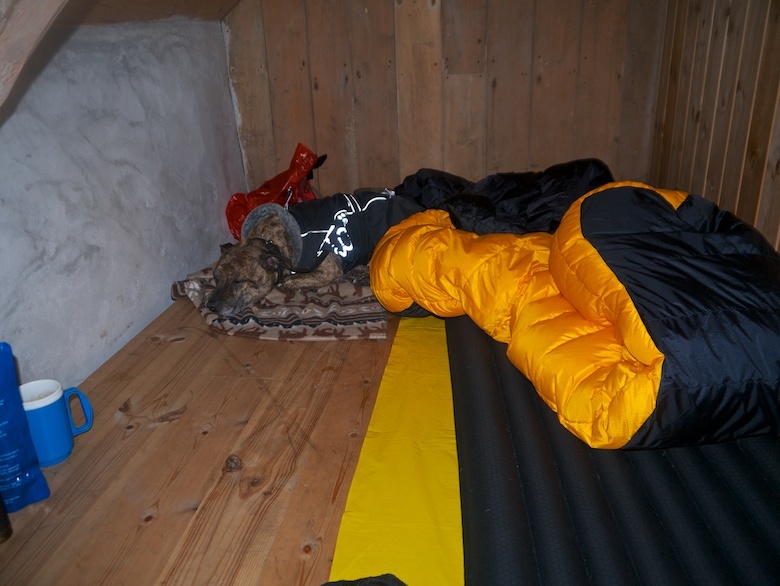 Therefore I lounged in my sleeping bag until about 9.00am, none to eager to get up in the cold damp bothy. A couple of hours was spent drinking loads of coffee and sawing some wood for the next visitors. At around 11.00am I decided that if I put off the inevitable any longer I could end up finishing the day in the dark. It was a steep climb behind the bothy to the forestry track above. This I followed before picking up the Byeway open to all traffic. This is a bit of a waterlogged mud fest. The main problem was the several fords that have to be crossed. 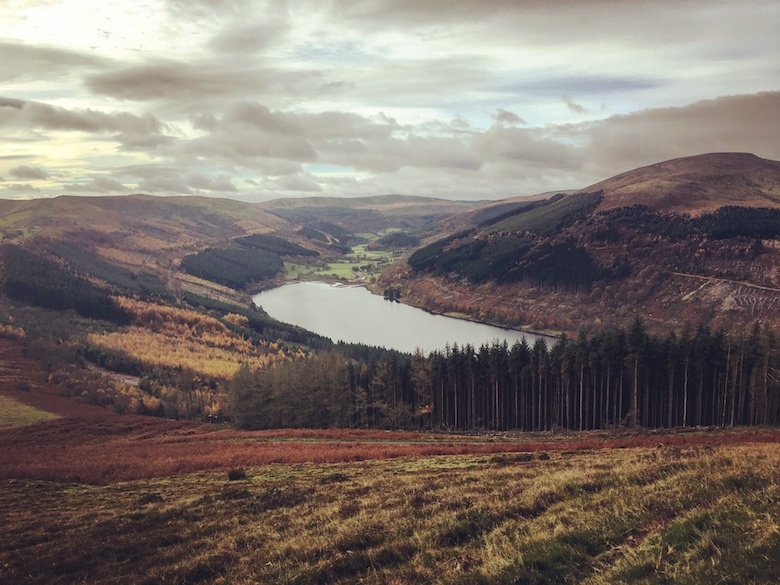 Although only knee-deep it meant that my boots were soon full of cold water, there was no way I was going to take them off every five minutes. Reuben had to be carried across the larger ones. It was on this track that I saw the only people before close to the end of the fourth day. Two quad bikers working their way across one of the fords. The track got a bit too much hard work for me in the end, a parallel forestry track a more attractive option. 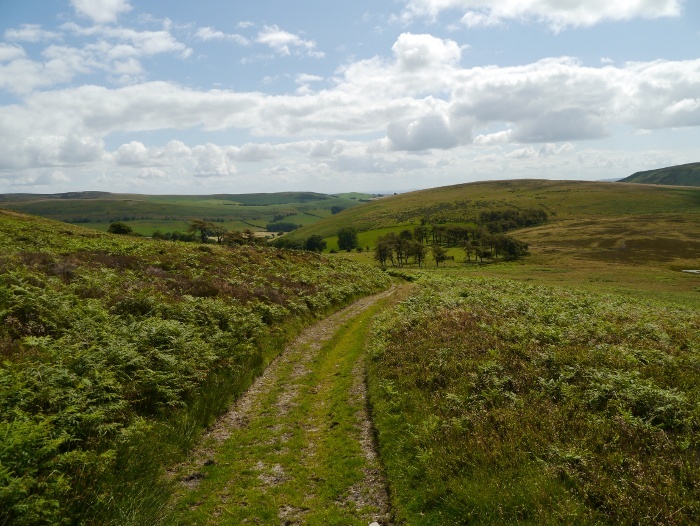 I had planned to take a bridleway through the forest and across the moors. However at that spot on the map I was greeted with a dense barrier of newly planted spruce. 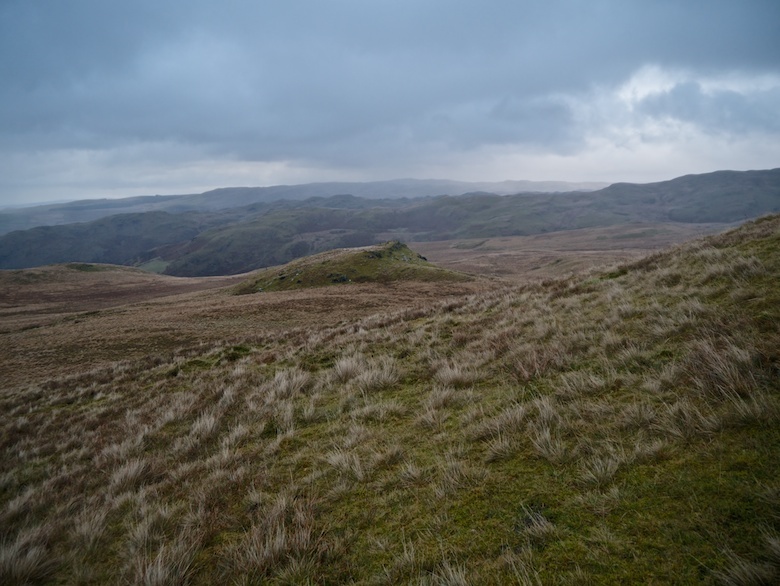 I backtracked a few hundred metres to a gate I had spotted, before an easy climb to the summit cairn of Pen-y-bwlch. 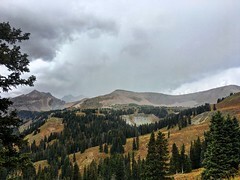 It was a grey and wild panorama that greeted us along with a face full of wind. 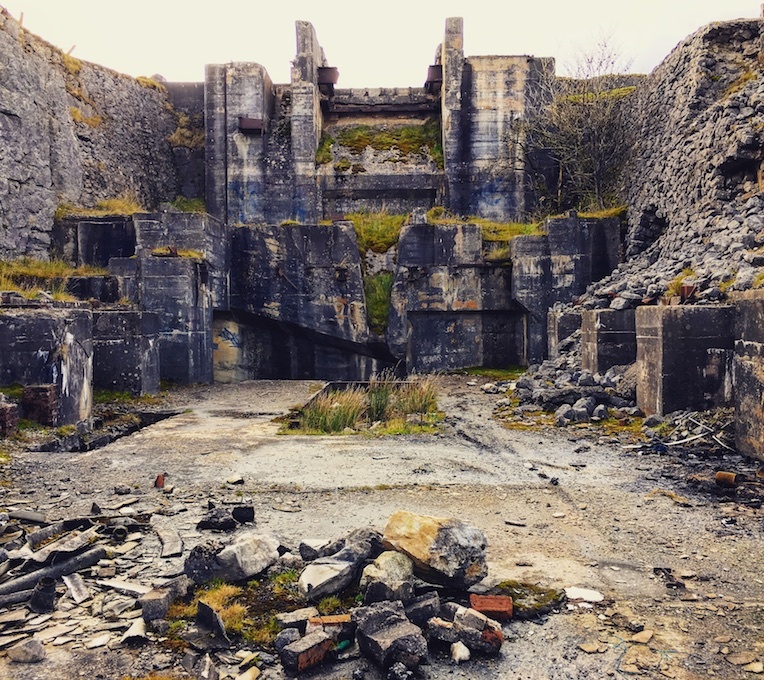 We arrived at the abandoned farm and shearing sheds of Garreglwyd just as a violent squall swept down from the moors. Shelter was taken in a barn whilst rain battered the rusty tin roof. 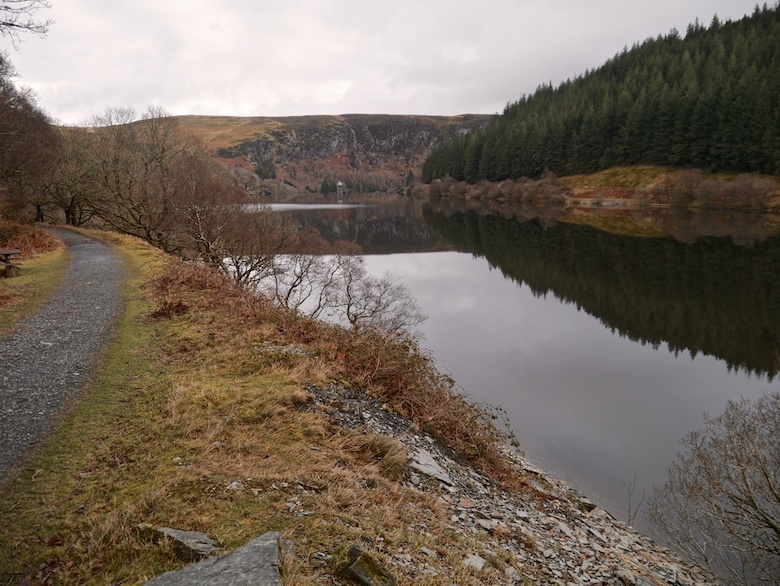 The traverse of Dibyn Du was less than pleasant in the rain and I was glad to finally reach the security of the track along Llyn Egnant. The bothy was reached during the last of the grey light. Once again it was dark and deserted inside, surprising in such an accessible bothy on a Saturday. There are no trees in the vicinity and the woodshed was empty, a great disappointment as I dripped into the main room. My rucksack when taken off soon sat within a widening pool of water. 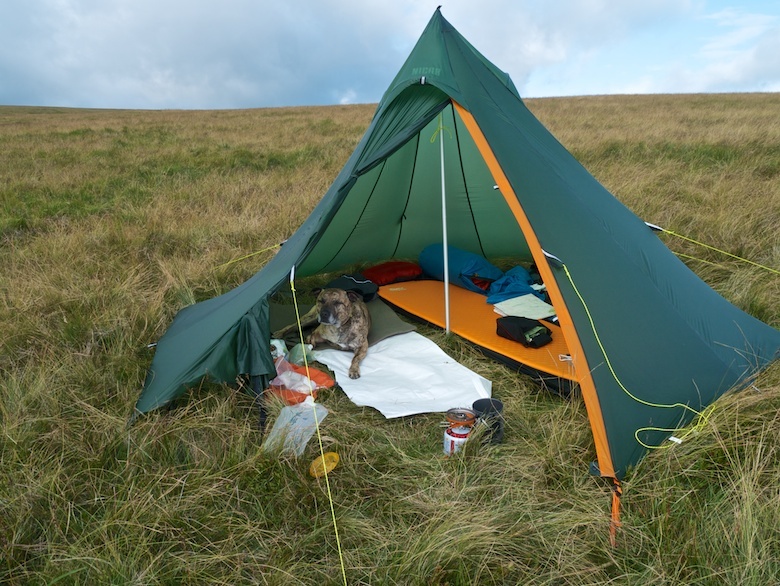 Paramo is often given a bad press with regards to its waterproofness but I am glad to say I was totally dry under my Cascada. On the other hand my eVent clad legs were soaked. The downstairs was cold and uninviting without a fire, so we quickly retired to one of the wood panelled bedrooms upstairs. With candles burning and dinner on it felt reasonable cosy (although it was only 4C up there). However I do wish that I had not read someones ghostly experiences in the bothy book. Thankfully the ‘Beware of the ghost’ graffiti on the stairs had been removed since my last visit! I can report that nothing went bump in the night. The world was transformed the following morning, sunny skies and a slight touch of frost. It is much easier to get up, packed and going when the weather is fine. I enjoyed a couple of cups of coffee in the sun outside the bothy before setting off. It really is a lovely little building in a fine setting. 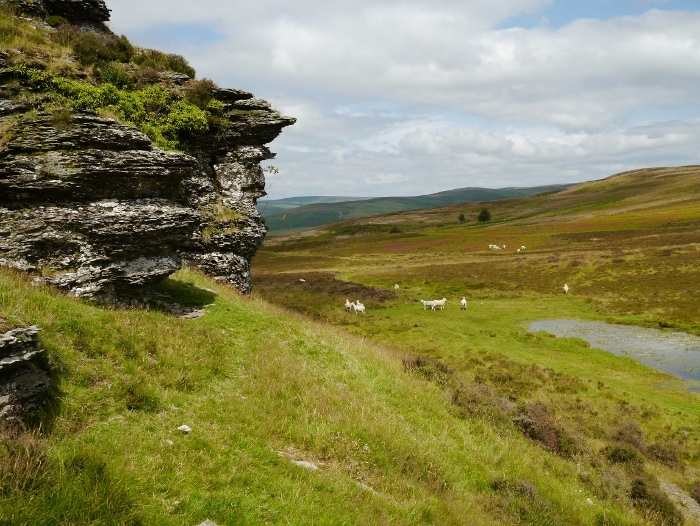 I’m glad that the weather had turned for the best as the plan for the day was a long high level tramp across the moors. The minor road gradually transforms itself into a track that deteriorates the further you go. 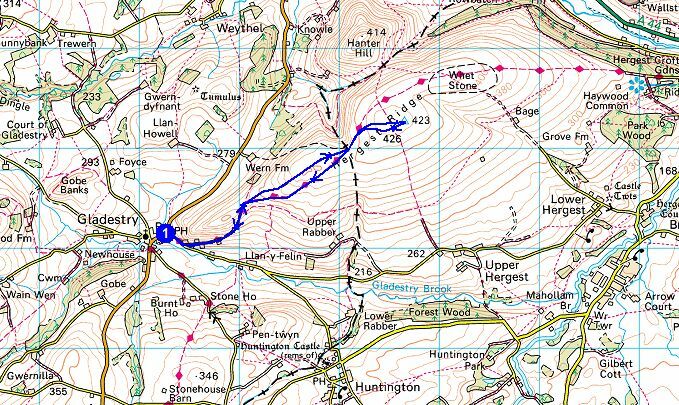 I wanted to walk the full length of the Monk’s Trod which on my map starts in the middle of nowhere on the banks of the River Claerwen. 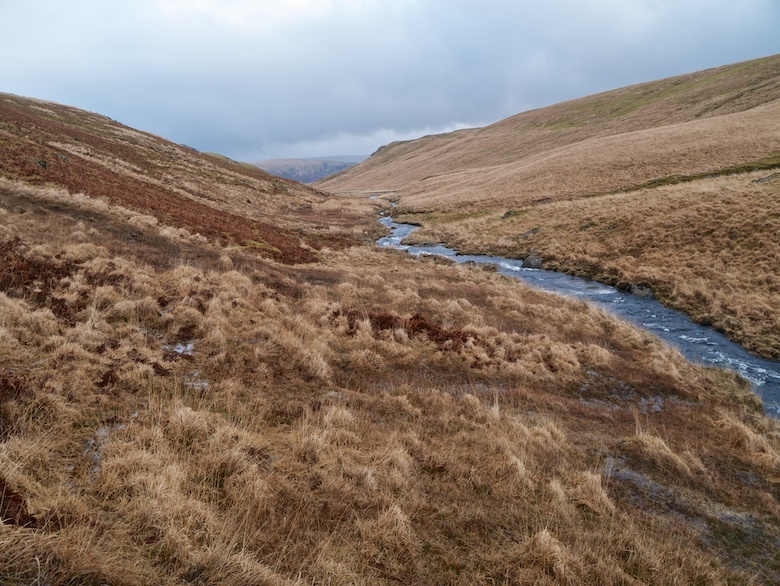 A marked track on the map cuts a corner between the Claerddu and the Claerwen rivers before unceremoniously dumping you right in the middle of a bog. 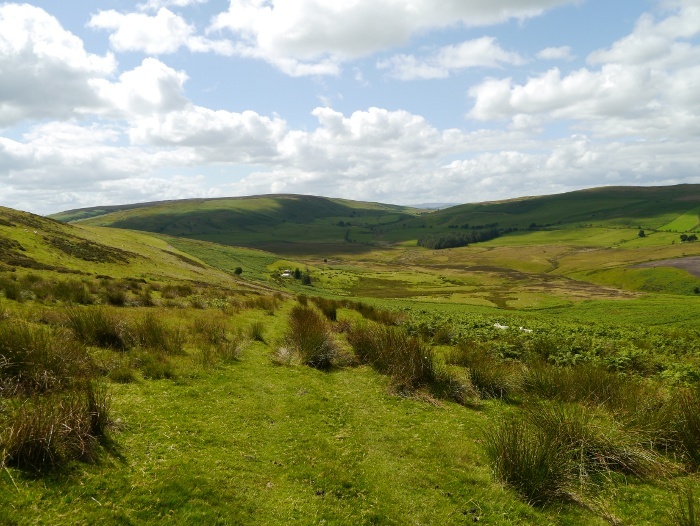 A word of warning about the Elan bogs. They are among the few that I actually consider to be dangerous. 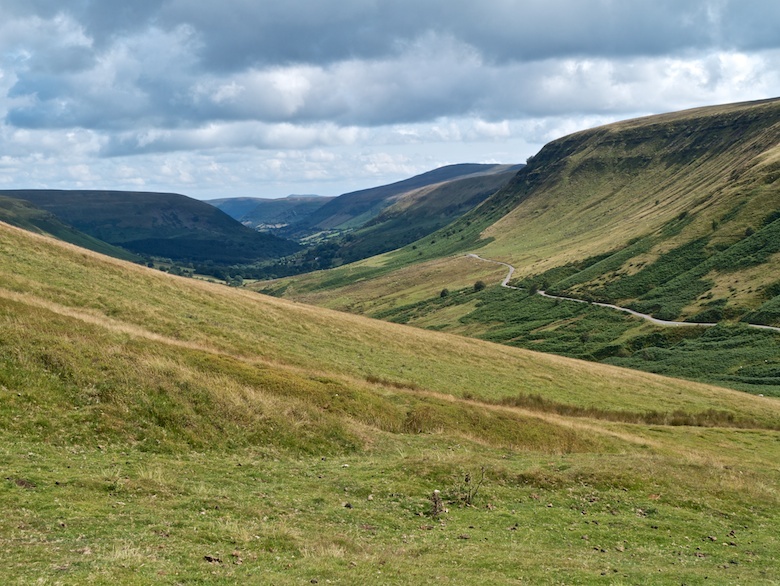 Take your time, carry walking poles and check the ground in front of you if it looks dodgy. Either that or take a dog and let him go first. 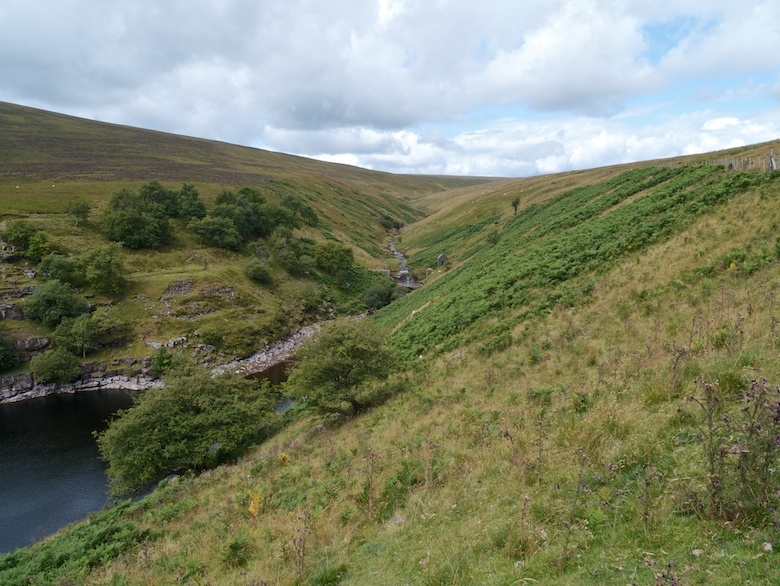 Bog safely crossed and the next major obstacle was the Afon Claerwen itself. This is a pretty big river and it has been raining for what feels like months. Due to the crossing of the bog my boots were already full of water so there was no point in removing them to keep my feet dry. I just picked a spot and waded, using poles for balance. The water was cold, especially as it splashed over my knees, soaking my trousers from just below the line of my undies. I was pleased that I got to the other side without mishap. Reuben decided that he did not want to follow. Instead he made unhappy dog noises and ran up and down the river bank. 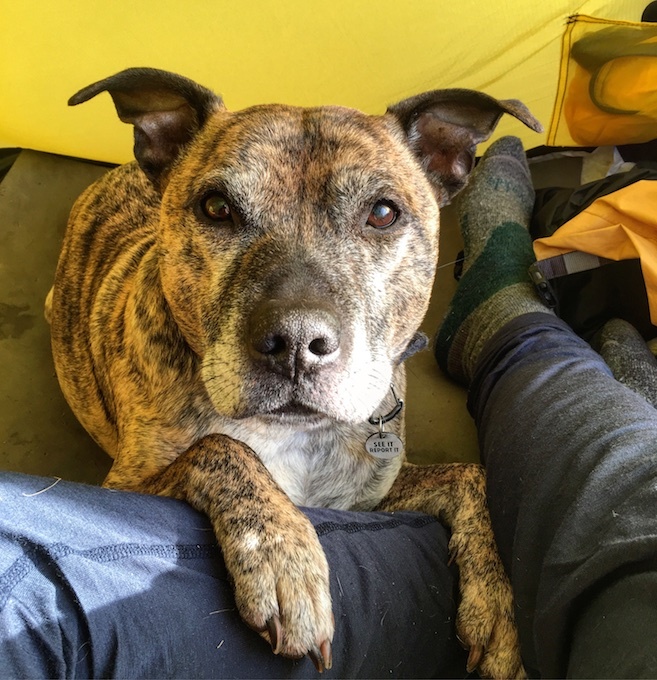 In the end I had to cross back and then make a third crossing with 23kg of unhappy Staffy in my arms. A very wet backpacker then found a rock to sit on for half an hour to steam in the sun. I crossed this very spot one April, sitting down to put my boots back on. I looked up to see three red kites circling overhead. As I looked down a large otter popped out of the water a couple of feet away and ran into the nearby rushes. Possibly the best wildlife encounter of my life (with the exception of seeing a rhino whilst going out for a bike ride in Nepal). Crossing the Monk’s Trod was much more pleasant than it was all those years ago. Vehicles have since been banned and it appears that people have been respecting that ban. 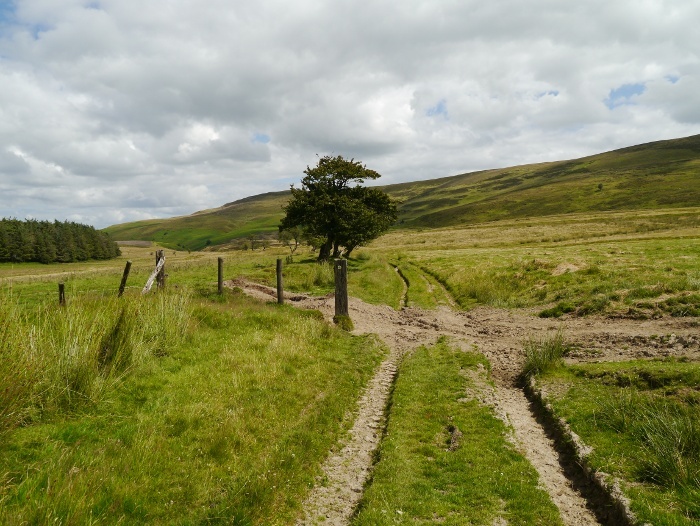 I remember a horrid boggy struggle for a few miles. There were still a few unpleasant stretches but in the whole the going was easy, giving the opportunity to enjoy the views along the way. 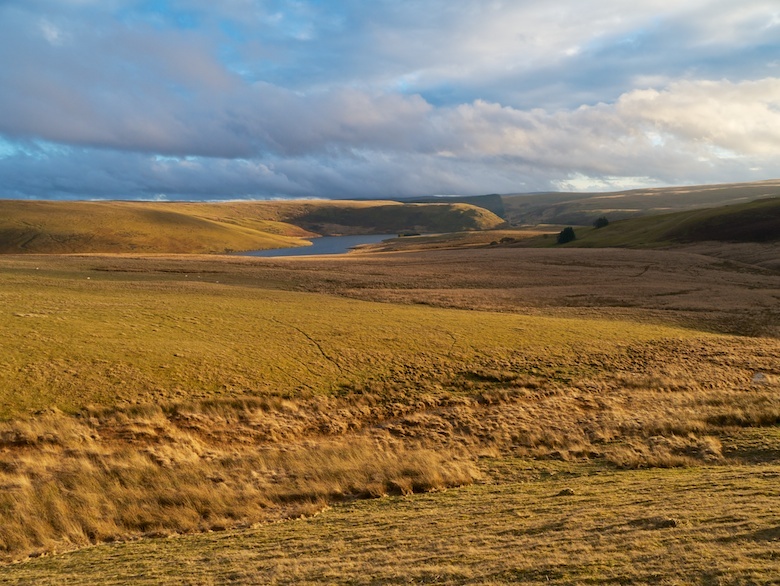 As the track dropped from the moors and crossed pastures the low winter sun lit up the surrounding hills. A fantastic moment and well worth the unpleasant rainy slog the day before. 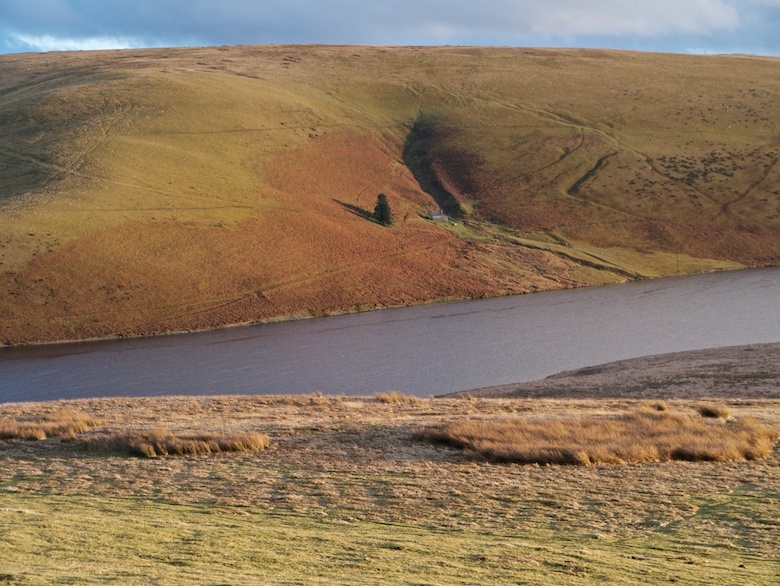 I could make out my bothy accommodation on the other side of the reservoir, close in distance but still a long distance on foot. An hour later and it was nearly dark when I arrived at the door. For the third night in a row I entered an empty bothy. This one had been recently re-built which meant that there was plenty of off-cuts of wood to fire up the large stove. 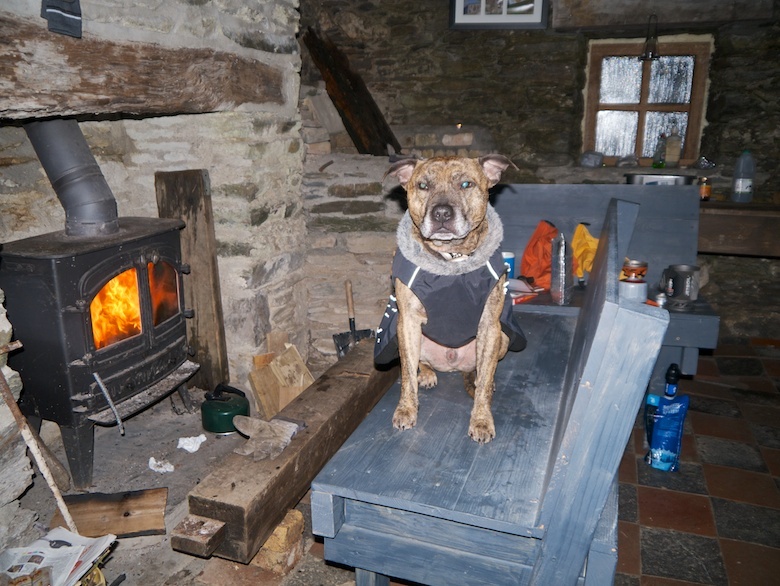 A really enjoyable evening was spent with Reuben on a newly built bench, the fire warming our bodies. Reuben was much happier than he appears in this photo, honest! There was a weird moment in the middle of the night when I woke with a start thinking that someone was banging loudly on the door. No one was and I think (or hope) that it was the remnants of a dream. 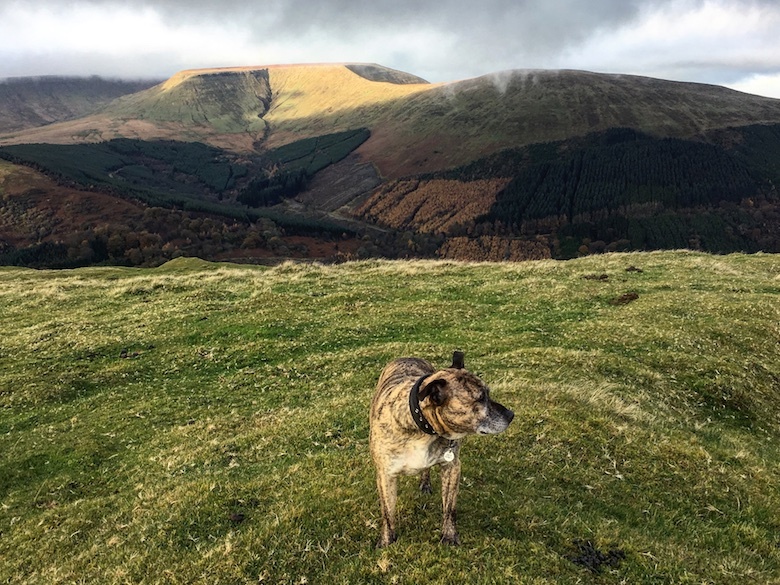 Reuben was very happy that morning as I discovered the ball I had carried for him in the bottom of my pack, perfect for a game of bothy fetch. 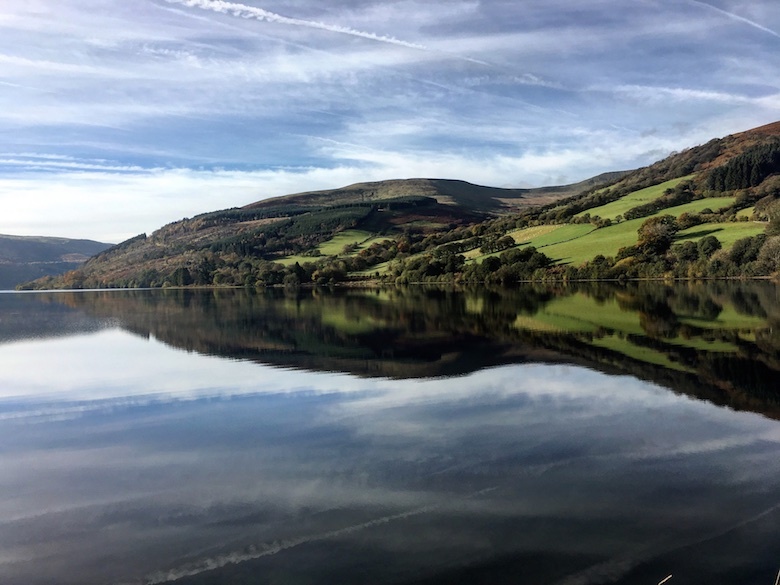 There was not a breath of wind that morning, the reservoir without a single ripple to disturb its surface. Rare calm after a tempestuous few weeks. 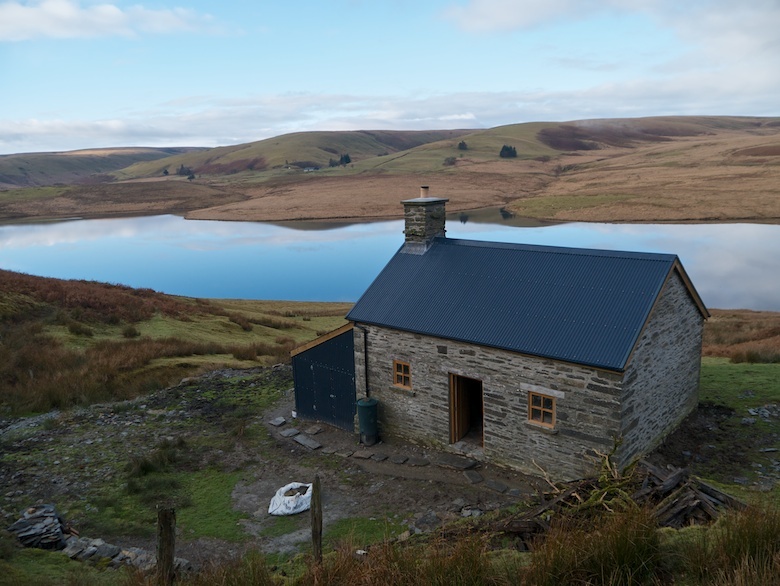 A superb location for a bothy. 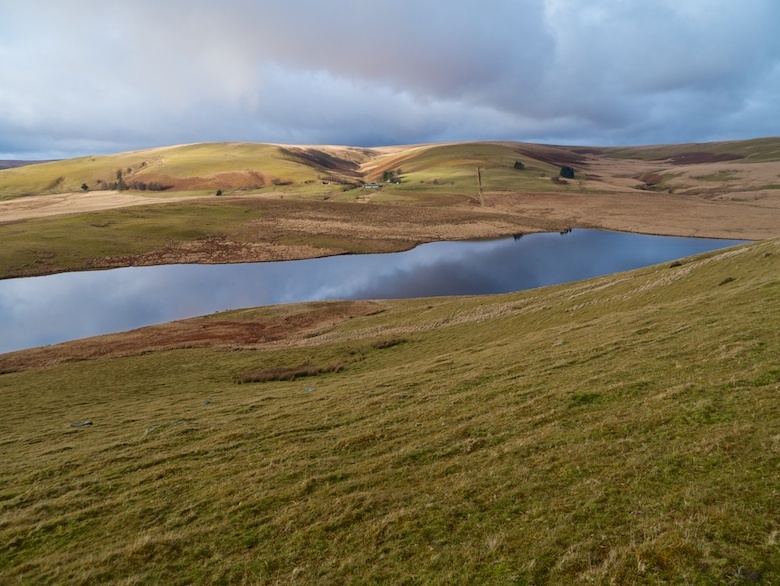 Our route along the reservoir was trackless, thankfully on a steep slope of cropped grass rather than through bog and tussocks. I stopped many times to watch the reflections of the sky on the surface of the water. 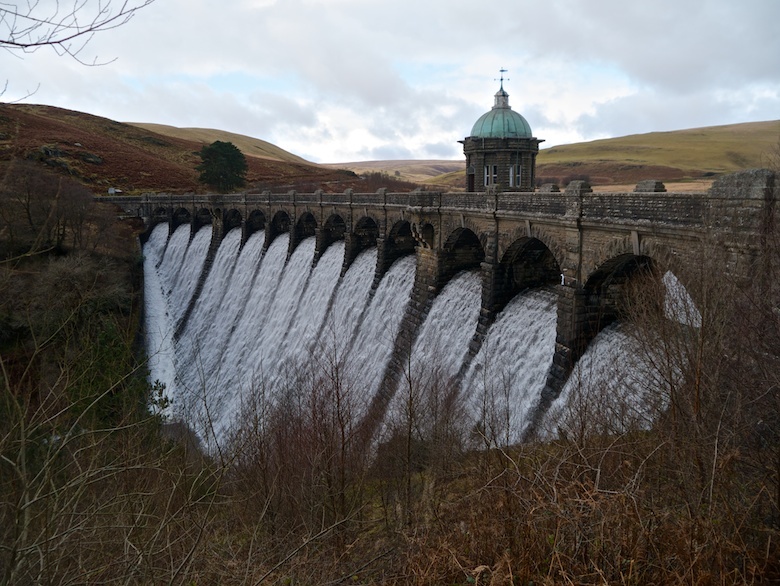 All of the dams in the valley were overflowing, huge man-made waterfalls with a powerful roar. A magnificent sight. 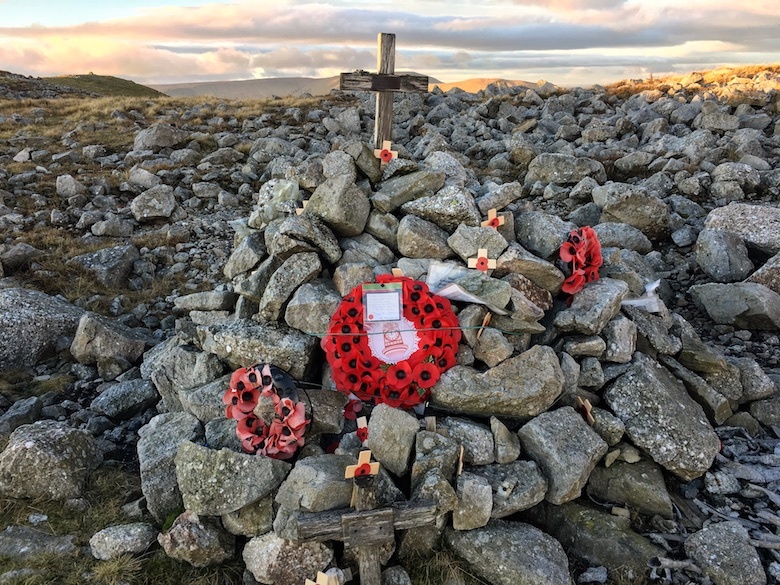 I had planned to cross the moors on a direct route back to the car. However I was feeling a bit lazy that morning. Instead I went for a slightly longer but much easier day. 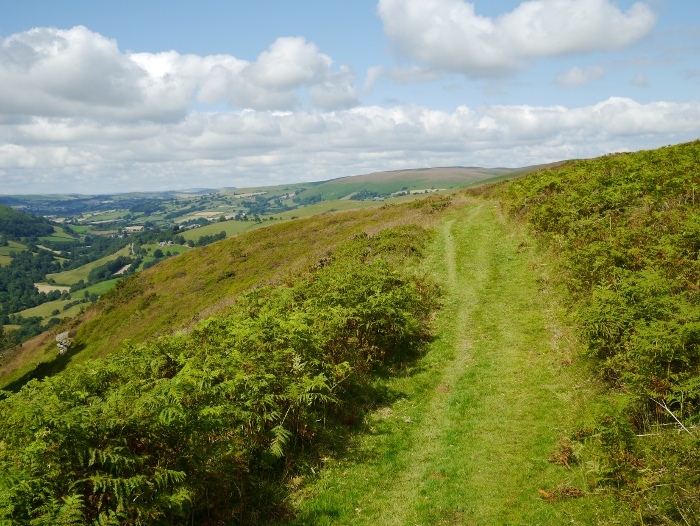 The disused railway bed provided swift and pleasant walking down the valley. Whilst stopping for a snack break the clouds that had been increasing all morning finally deposited a steady rain. Reuben hid under the bench and gave me a look that suggested that it was all my fault. A final climb up through the forest and past a collection of telecoms related paraphernalia brought me back to the car. The sun even came back to pay a visit before I drove home. 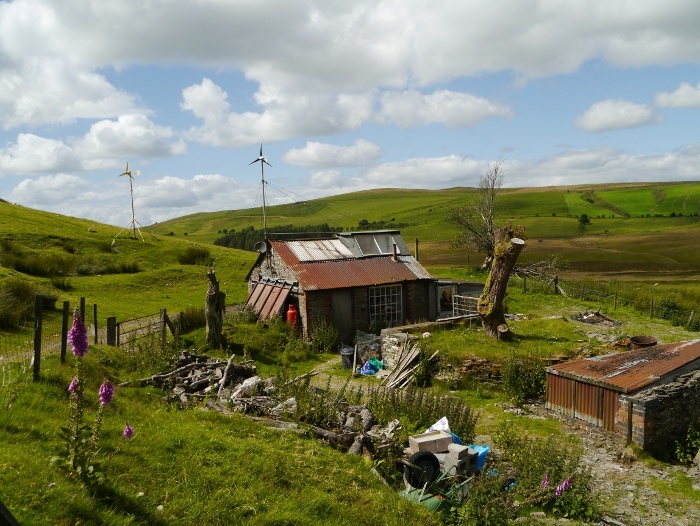 The Mountain Bothies Association (MBA) is a fine organisation. I have purposely not mentioned the names of where I stayed, or where they are located. My usual route maps are also missing. 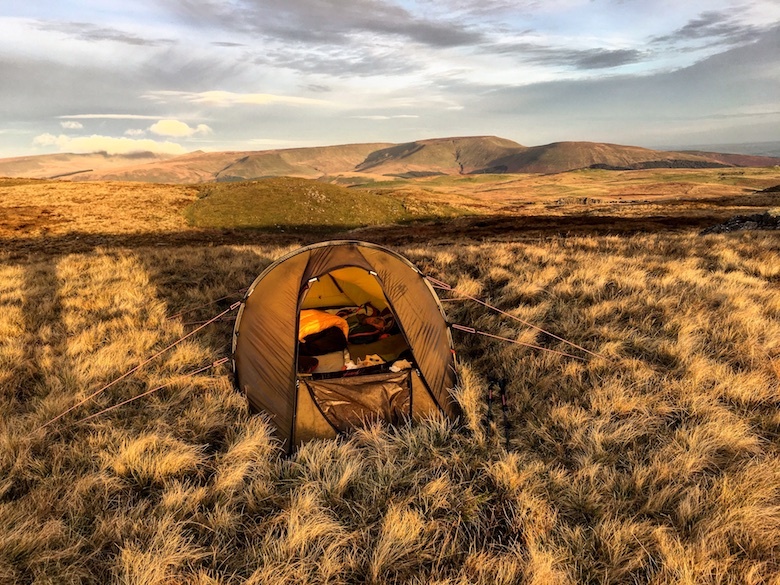 Planning a bothy adventure? Consider joining the MBA and check out their website here. 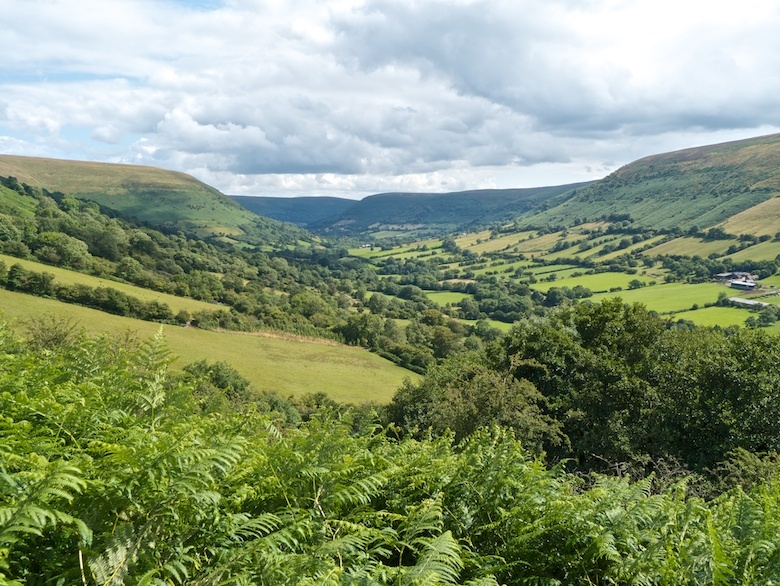 North of the Black Mountains and to the east of the Cambrian Mountains sits a little know tract of hill country. 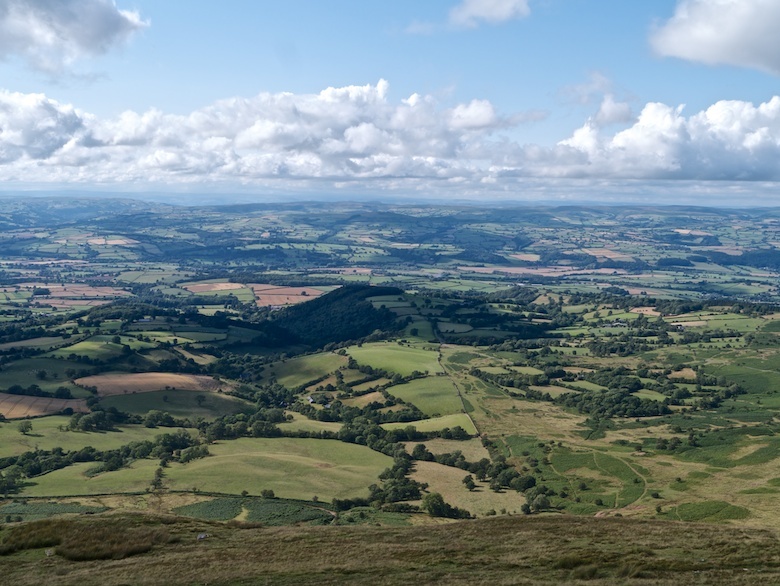 Between Hay-On-Wye in the south and Newtown in the north there is a long line of hills close to the English border. 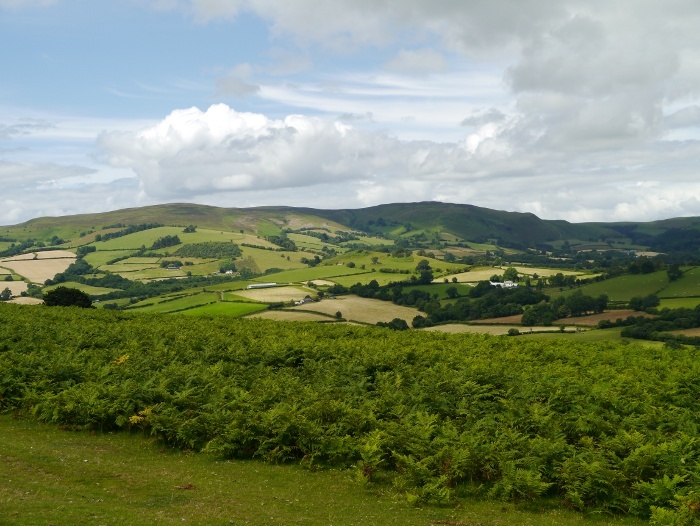 These are gentle, whale back hills which culminate on the heights of Great Rhos and the Radnor Forest, just rising above the 2000ft contour. 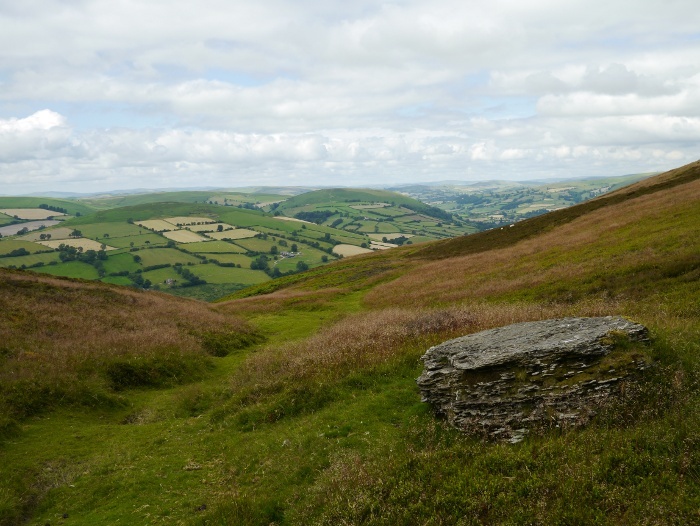 This hill range does not really have a name, so for the purpose of these two posts I am going to refer to them as the Radnorshire hills. 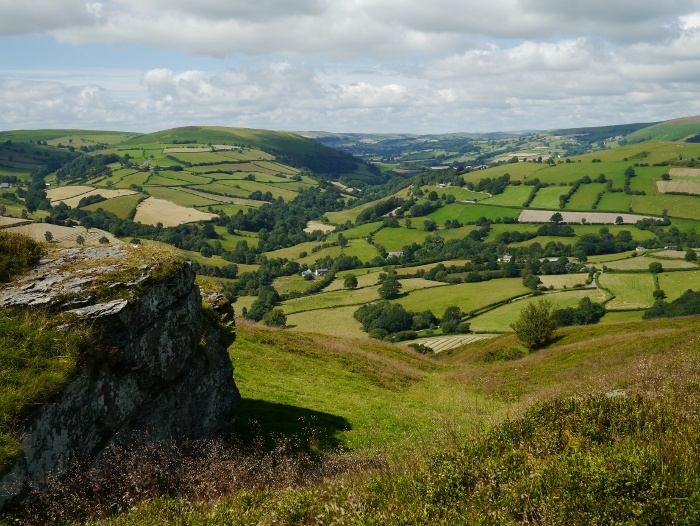 Although Radnorshire itself was long swallowed up by the huge county of Powys. 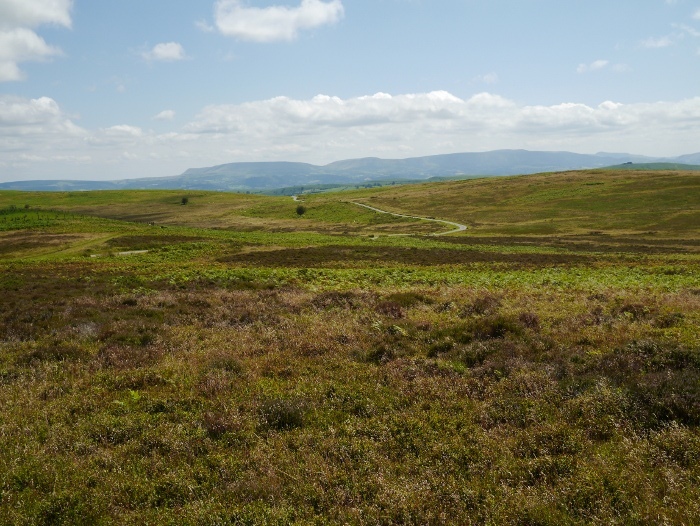 Sandwiched between the heights of Great Rhos and the Black mountains is a large area of empty moorland. 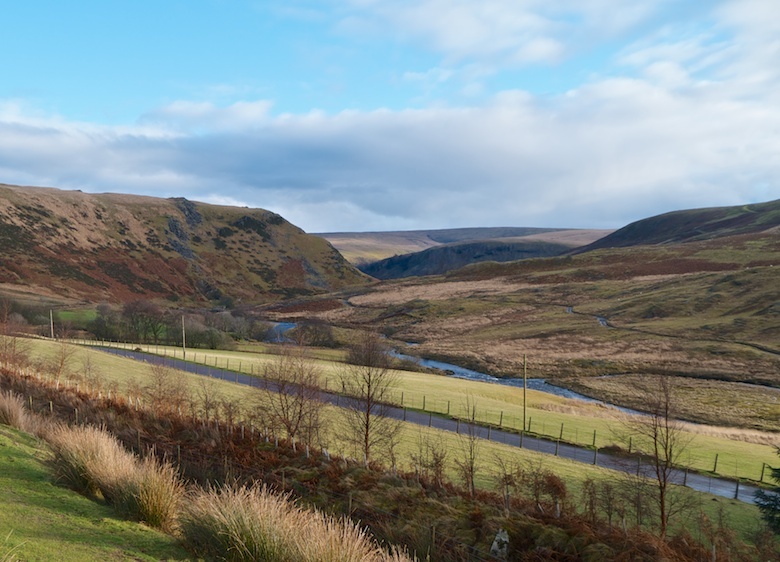 Lush green valleys cut through the moors giving a contrast between the bleak and pastoral. 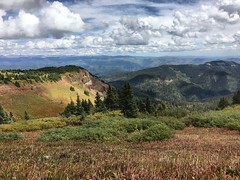 This area has been on my radar for years now but I have never really managed to put together a satisfactory backpacking route. 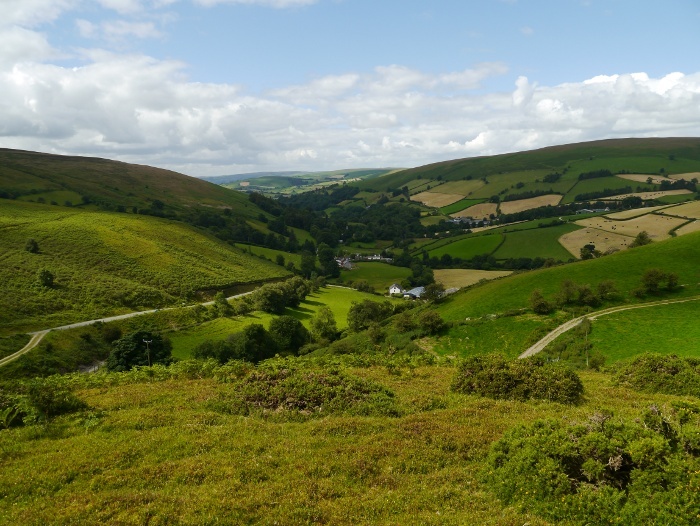 Although very remote in terms of nearby towns and villages it is a landscape dotted with farms and criss-crossed by narrow lanes. 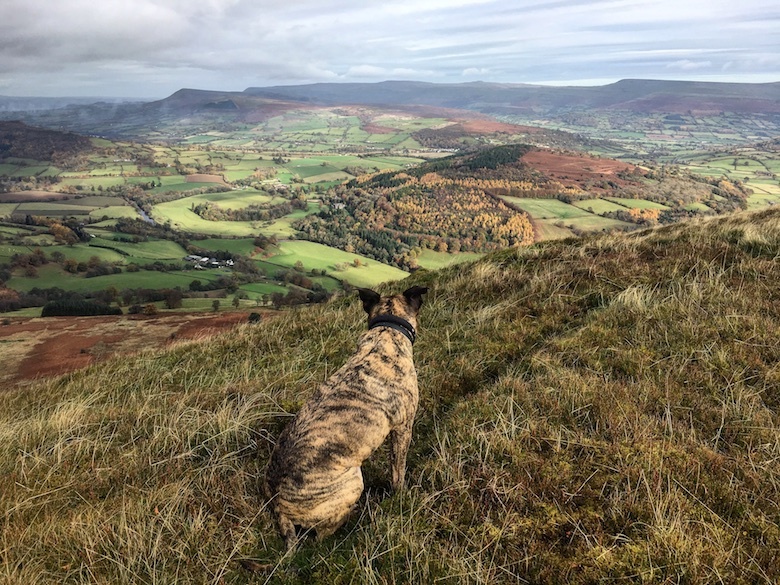 Finding a hidden pitch and locating suitable water sources could be an issue. 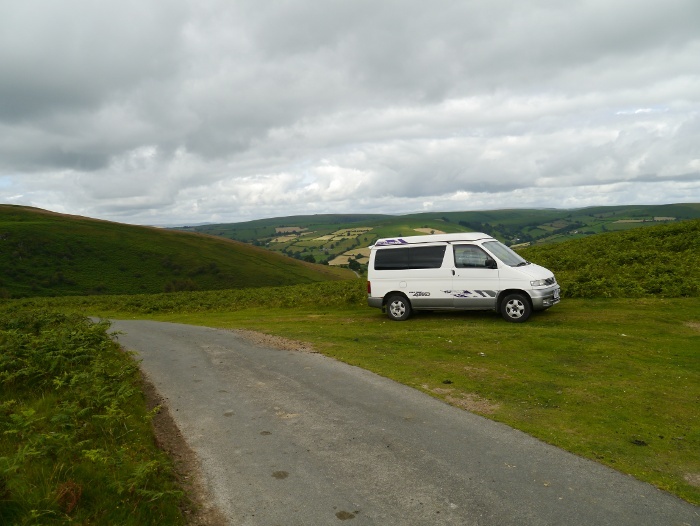 The Bongo has been neglected recently and these hills looked like a perfect area for a spot of van wild camping. 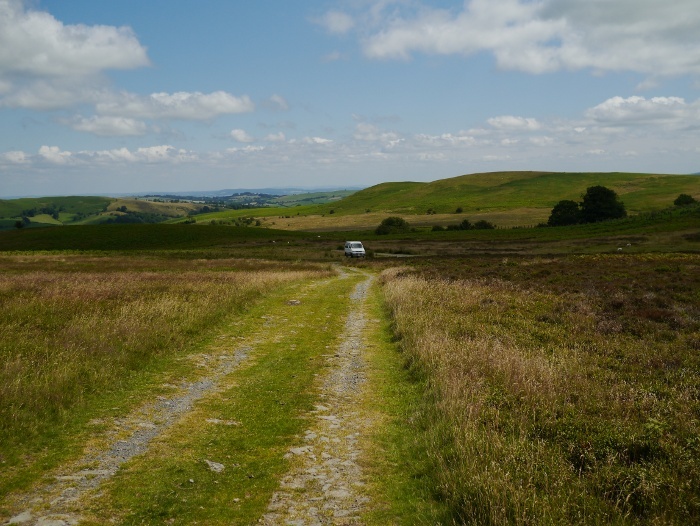 The many high moorland roads with the potential to provide ideal spots to park up for the night. My ankle was also playing up from a fall a couple of weeks previously so some short walks with a day pack would be ideal. Due to the ankle, Reuben sadly had to be left at home. I wanted to be able to use my Pacerpoles for support rather than being dragged along by a mass of muscle! It was nearly 2.00pm by the time I parked the van and had finished a lengthy faff. 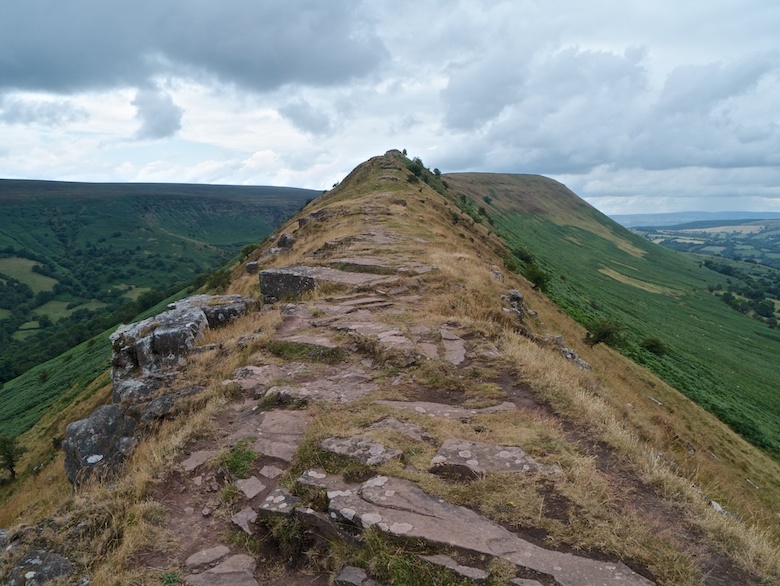 I had chosen to start the walk high up at 430 metres, aware that I may regret that most of the climbing would be at the end of the day. 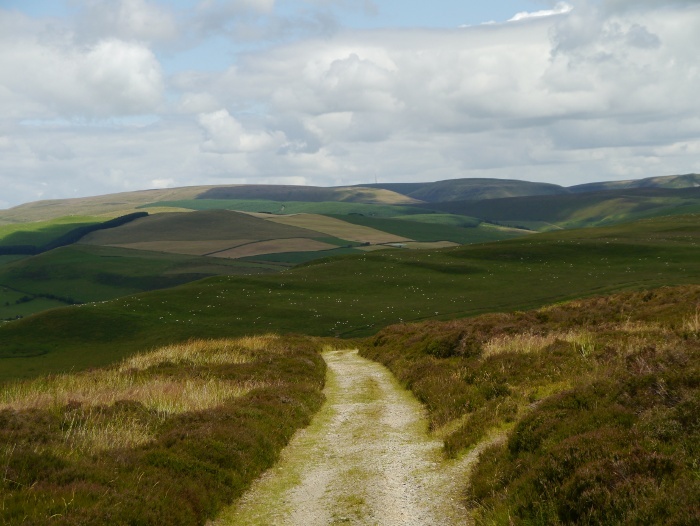 However it was nice to start effortlessly with extensive views back across the English borders. To the south sat a long line of high mountains, clearly broken down into three parts. 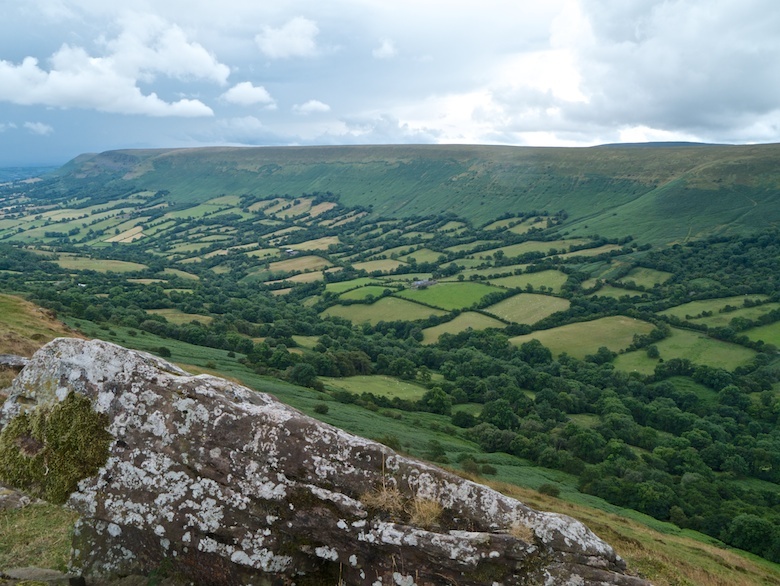 The whole of the northern escarpment of the Brecon Beacons National park filled the horizon. 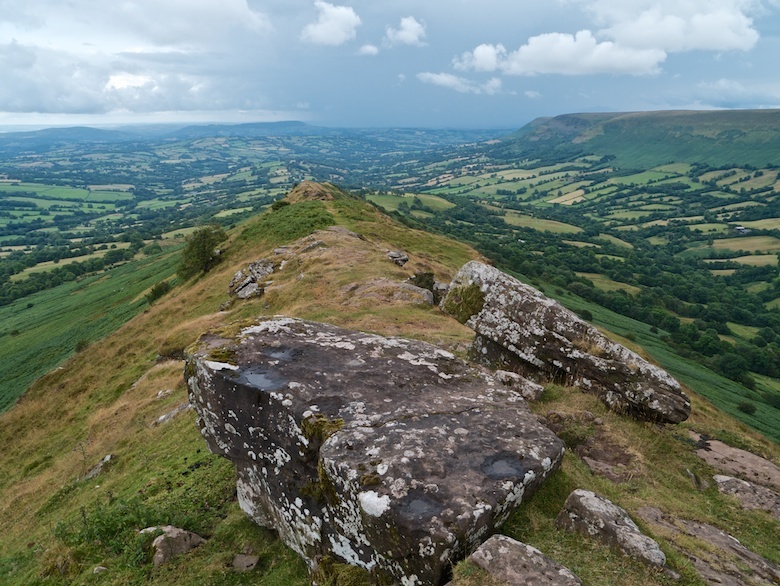 I could make out the Black Mountains in the east, the Brecon Beacons themselves, and far to the west the Black Mountain. I planned to spend the evening on a hill further to the south which is supposed to give one of the best grandstand views of them. 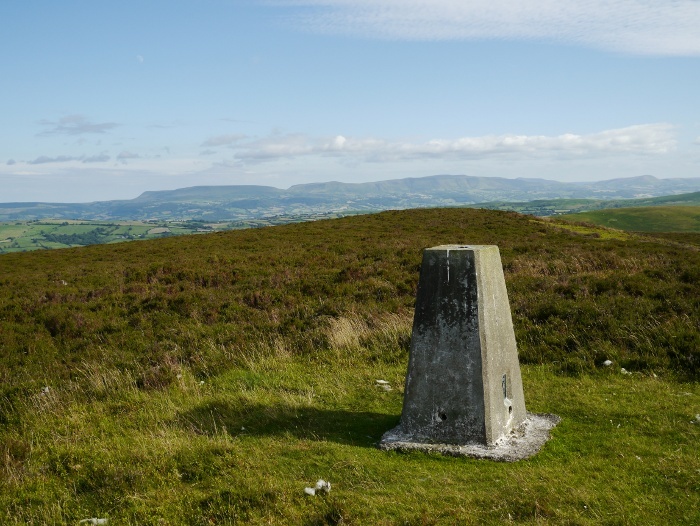 Llanbedr hill is a breeze to walk across, a wide track allowing swift progress. 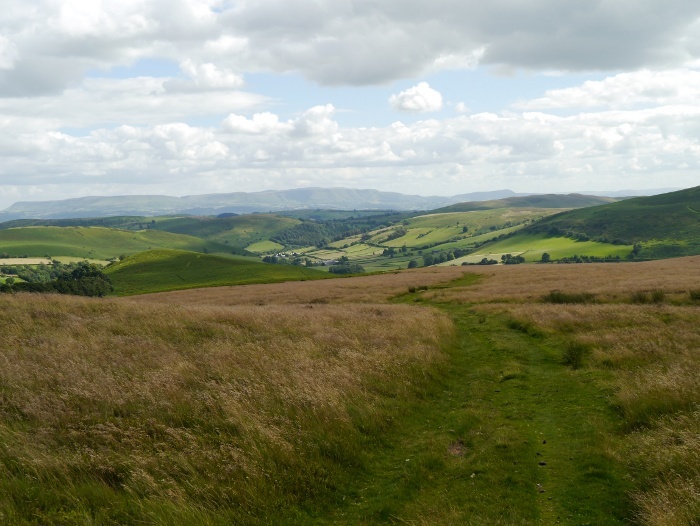 This is excellent open country, empty hills rolling into the distance. If you want thrills with your hills I advise you to stay away! 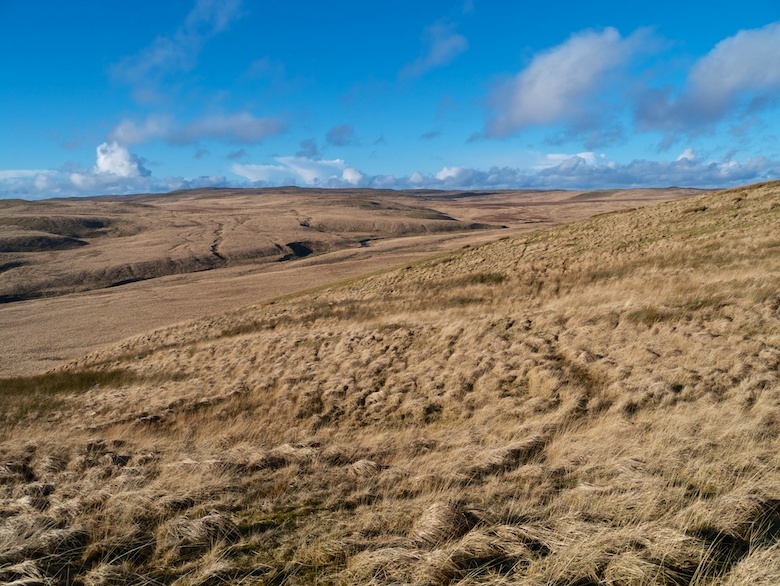 Gareg Lwyd is one of a few outcrops that break the landscape and provide a feature on this long finger of moorland. It is a particularly attractive spot with a pool at the base of the rocks. It was an excellent spot to sit, the rocks providing shelter from the breeze. I watched a cyclist pass on the track I had walked, the only person I would see for the rest of the day. I got so relaxed that it was a bit of an effort to get myself moving again. 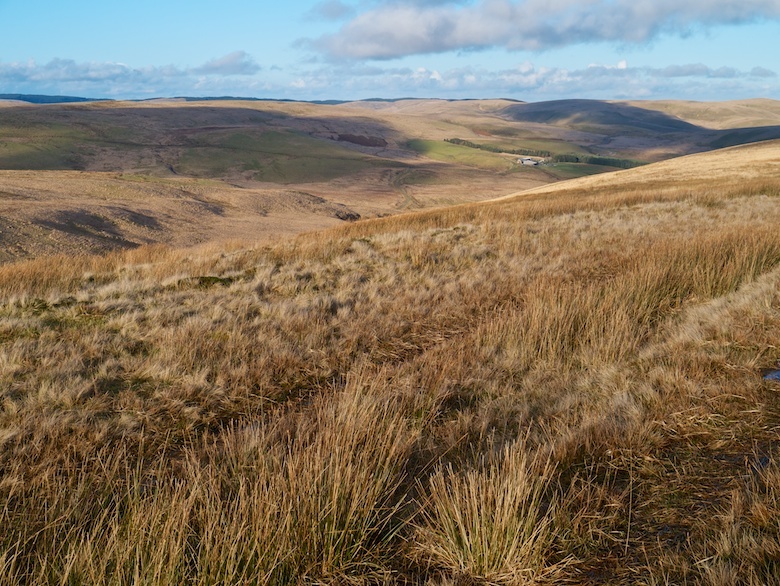 A narrow path across rough ground took me to Cwm Lago where I picked up a path that contours across the northern slopes of the hill. 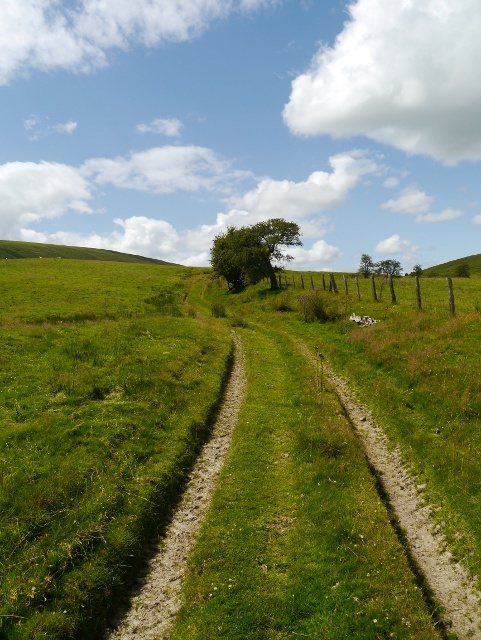 This path was simply a joy to walk with its sheep nibbled grassy surface, it almost invites you to remove your shoes and walk barefoot. 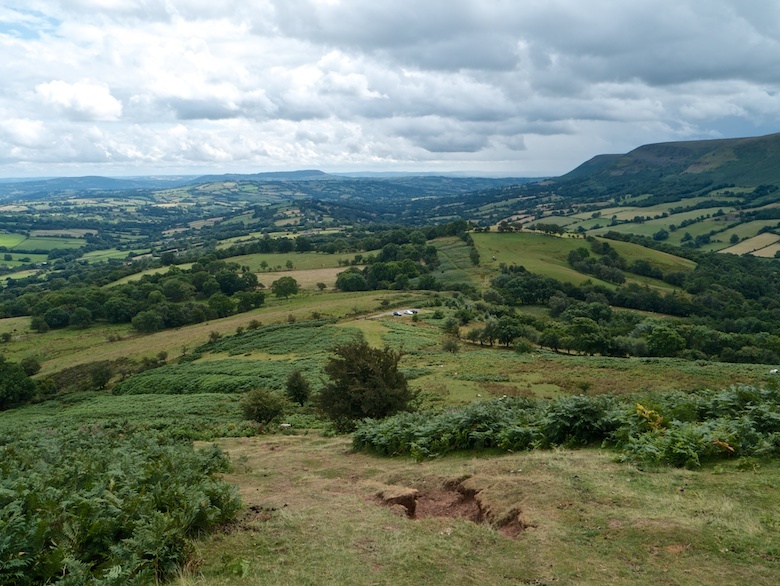 I floated along high above the Edw valley, the escarpment dropping steeply to a patchwork of fields. Everywhere I looked there was a riot of every shade of green and there was a smell of summer on the warm air. This played havoc with my hay fever! 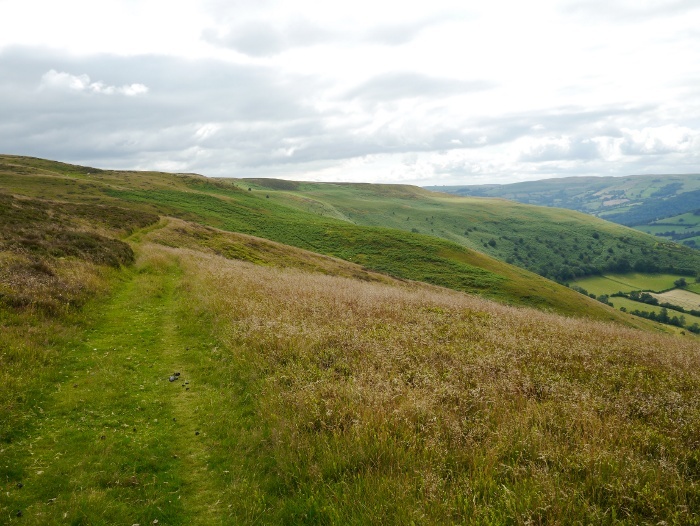 I would have been happy for the path to go on for ever as it descended gently towards the valley. Unfortunately it soon deposited me onto a steep minor lane. I soon branched off towards Rhulen along another lane that was barely wide enough for a vehicle, the high hedgerows towering above me. 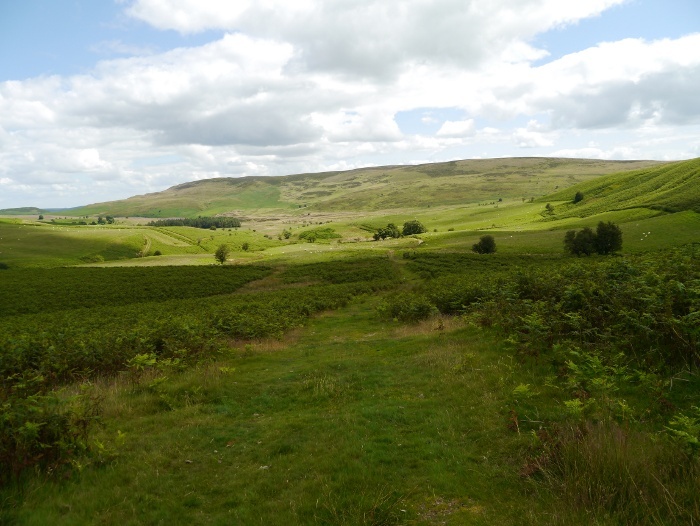 I was thankful for the shade they provided as I had lost the cooling breeze from the moorland heights. 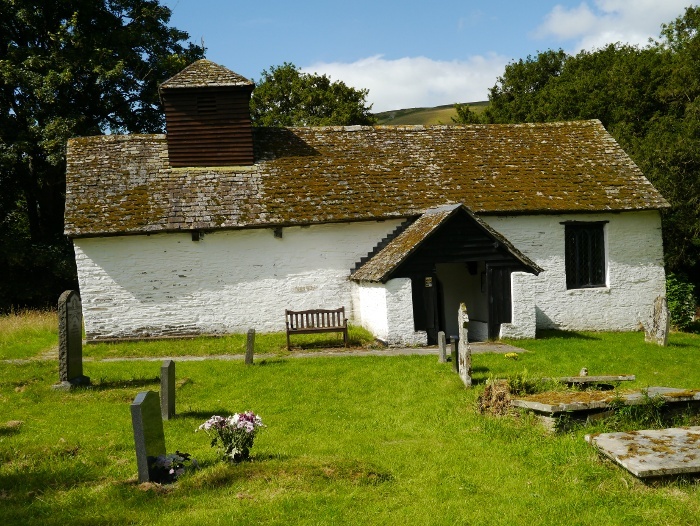 I don’t normally get very excited about churches but the one at Rhulen is a bit of a hidden gem. It’s a lovely old building and I spent a while nosing around its cool dark interior before utilising the bench in the churchyard. There was a real feeling of time having stood still there, the hustle and bustle of city life felt far far away. 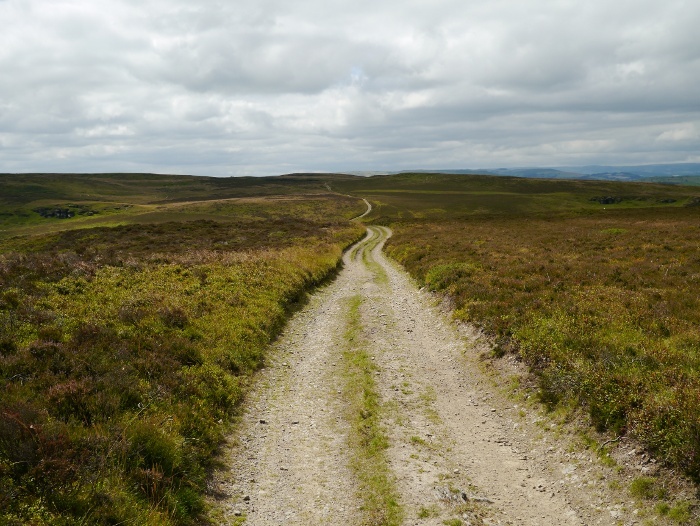 The road at the head of the valley turned into a track which gave an easy ascent back onto the moors. 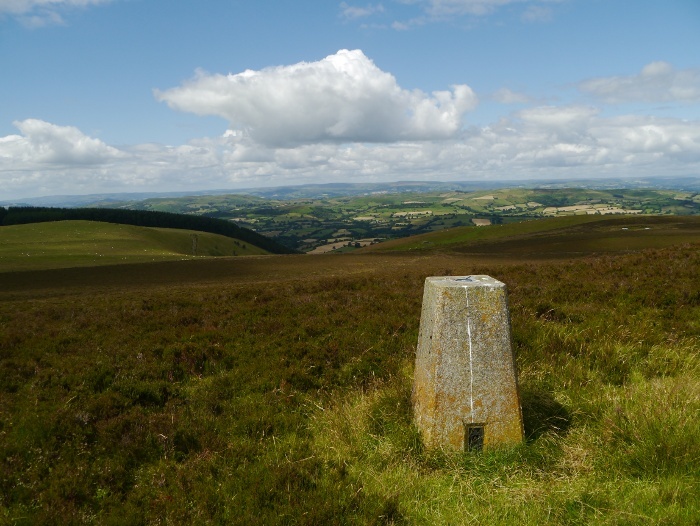 At its highest point I headed directly for the trig point on Red hill. The heather looked like a huge square had been mown into it, a curious feature but one I took full advantage of to get to the top. 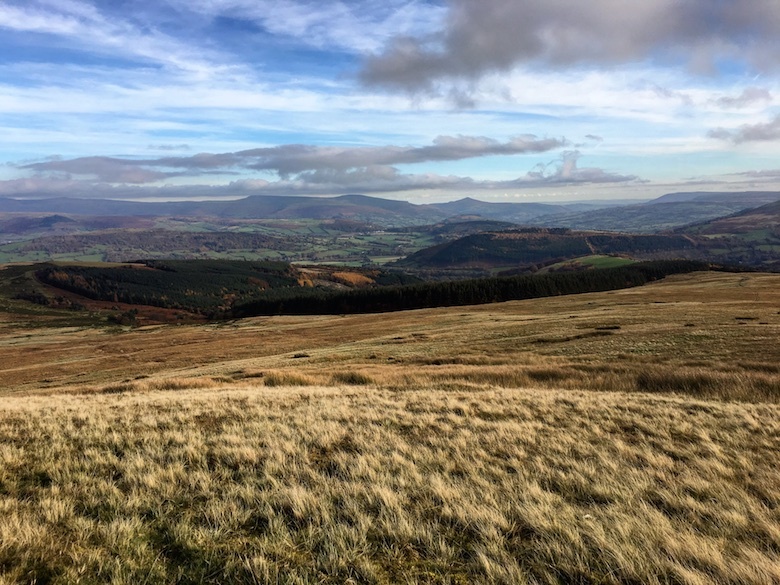 Views to the north were restricted by the bulk of Glascwm hill but to the south the line of the Brecon Beacons revealed their full glory. 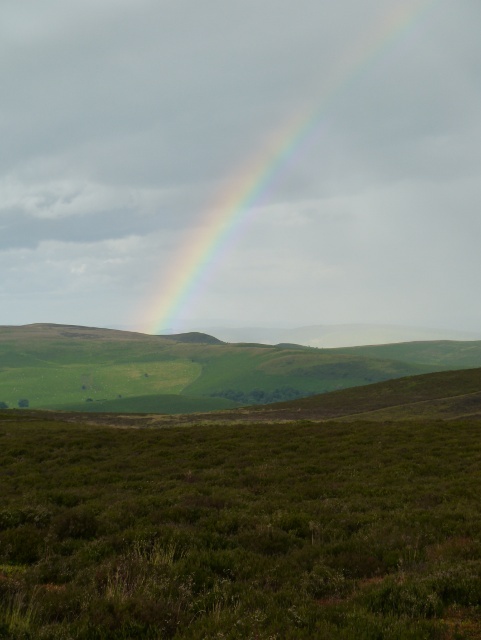 It was an easy yomp back down to the Bongo which I could see glimmering in the distance. 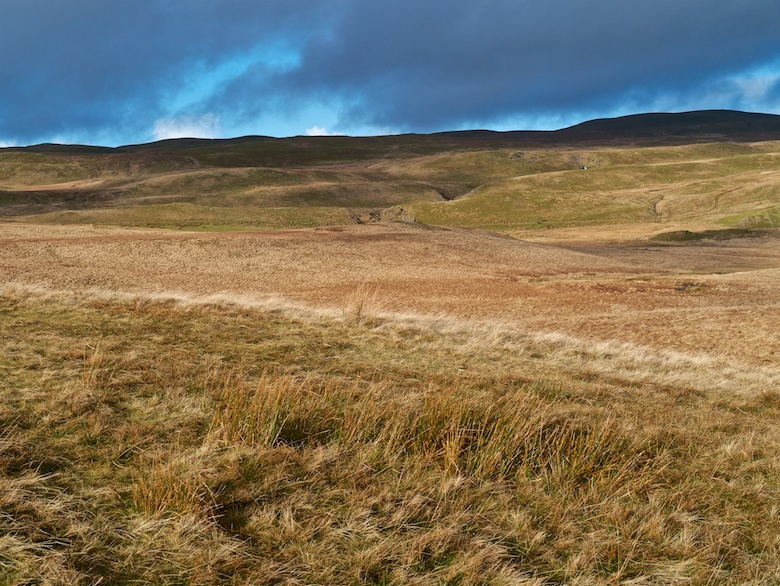 The wide grassy tracks across these moors mean that it is real hands in the pockets striding country. 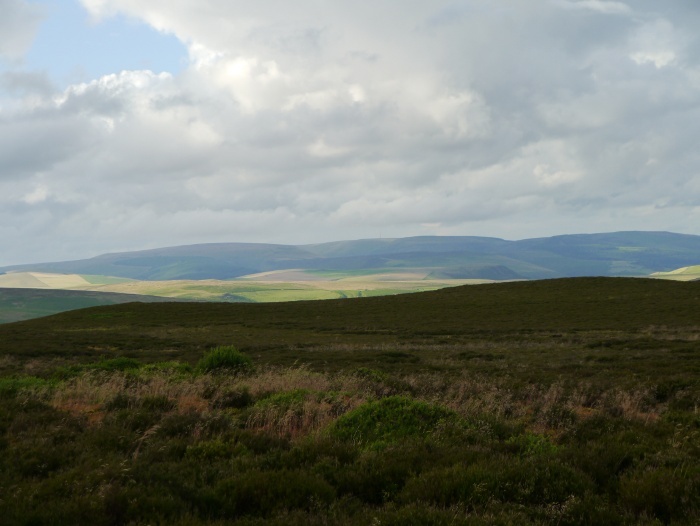 I had noticed on my maps an isolated hill just to the south of Paincastle which stood out when I got back to the Bongo. The Begwns are owned by the National Trust and I thought it would be an ideal place to watch the sun set. 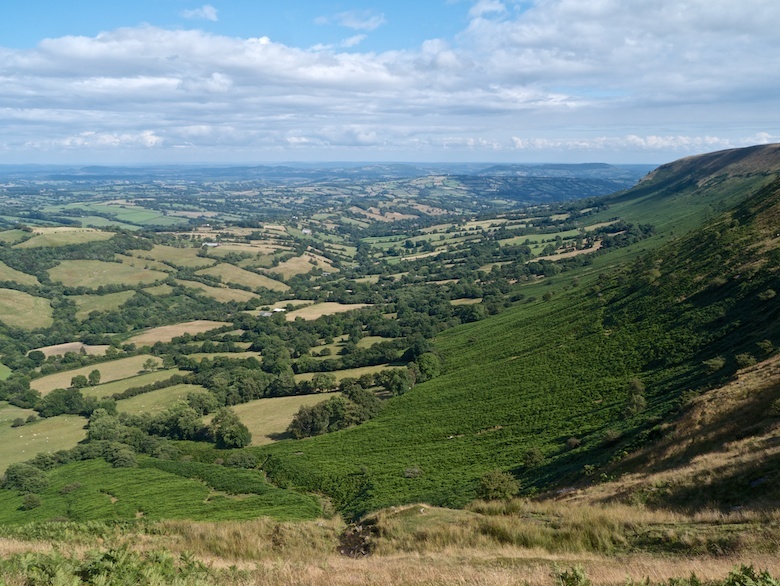 I drove the few miles south, fingers crossed that I would not meet any oncoming traffic on the steep and very narrow lanes, which are rather lacking in passing places. 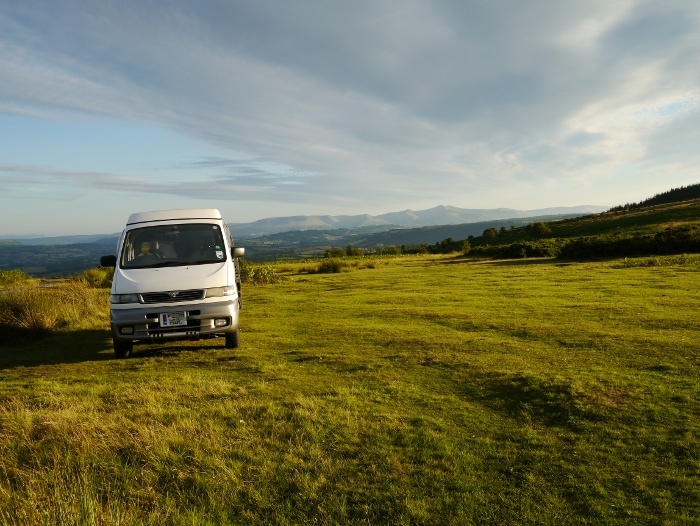 I parked on the common next to the road, a cracking spot with the Black Mountains looking rather special behind me in the sunshine. A farmer came rumbling down a track on the hill opposite and waved as he passed, which I took as an endorsement for the spot I had chosen. I sat and cooked dinner in the van, entertained by a young foal running about and making a right racket. 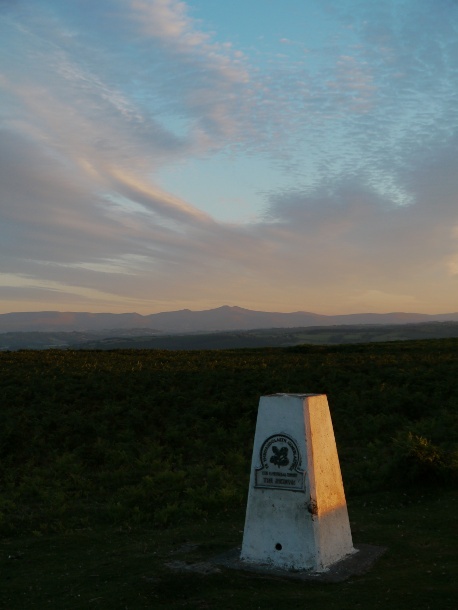 At about 9.00pm I made the short ten minute amble up to The Roundabout, which is the summit of the Begwns. The top itself is unmarked and hidden amongst some trees that sit within a large circular dry stone wall structure. A large seating area had been built inside by the millennium project of Painscastle. 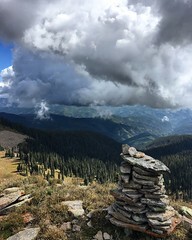 I would imagine that it would be a welcome spot to eat lunch on a wild windy day. 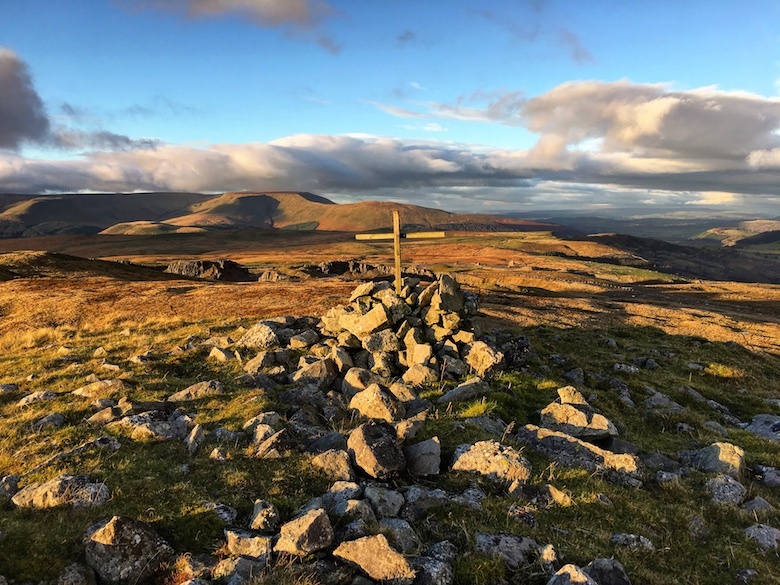 I wandered over to the trig point for grandstand views of Pen y Fan, the setting sun just beginning to give the sky a pinkish hue. 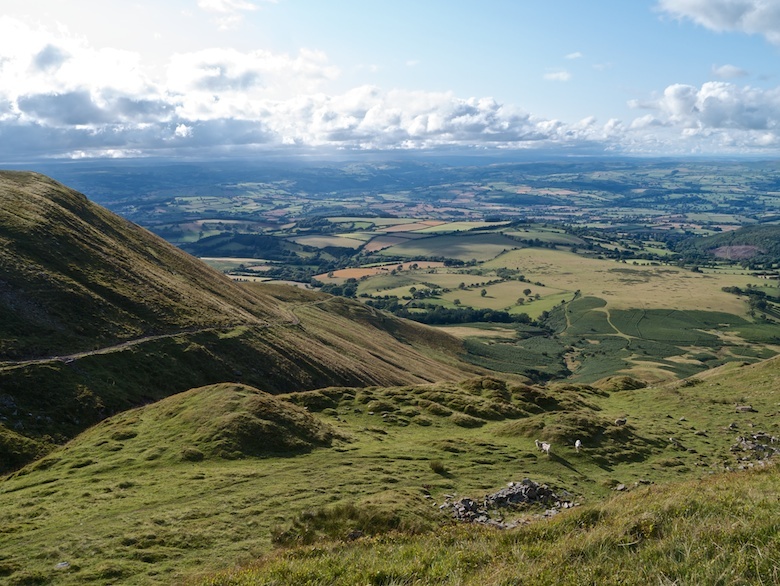 In terms of view versus the effort involved in getting to the top, this hill probably has the best ratio in the whole of Wales! Isolated from other high ground there is an extensive 360 panorama and I wandered around for a while taking it all in. 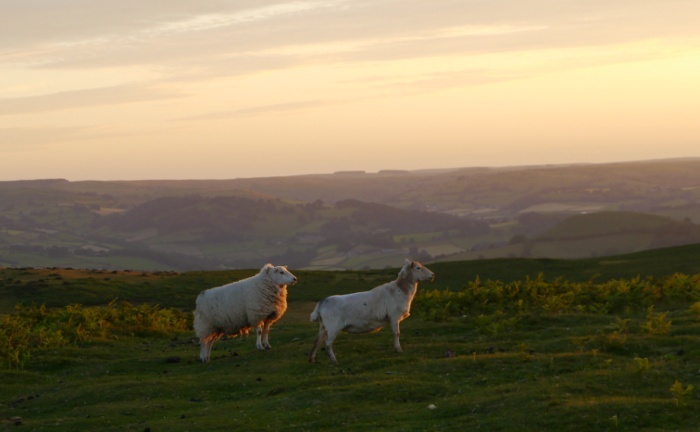 Even the sheep appeared to be transfixed by the view and the setting sun. 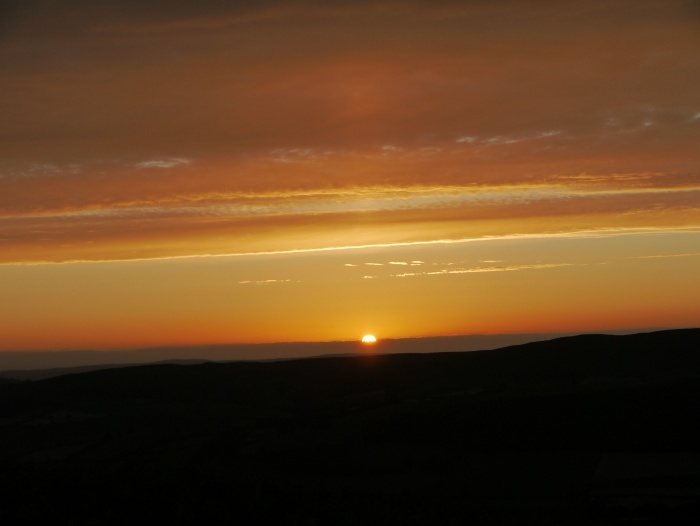 I walked a little way to the west and watched the sun slowly sink below the horizon, a light show that I will never tire of. With the spectacle over I slowly headed back down to the van, passing a group on their way up. 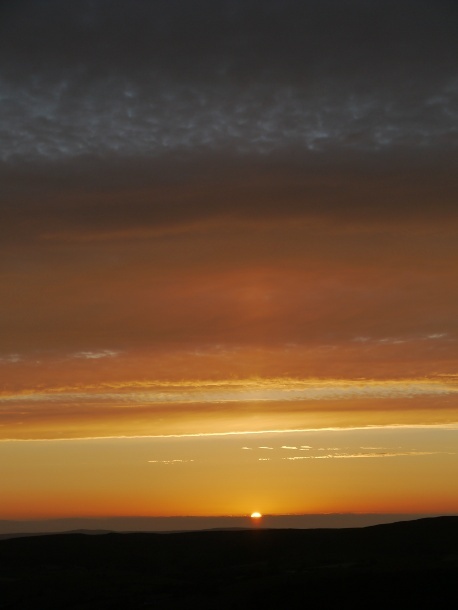 Sadly they had missed the sunset by a few minutes. 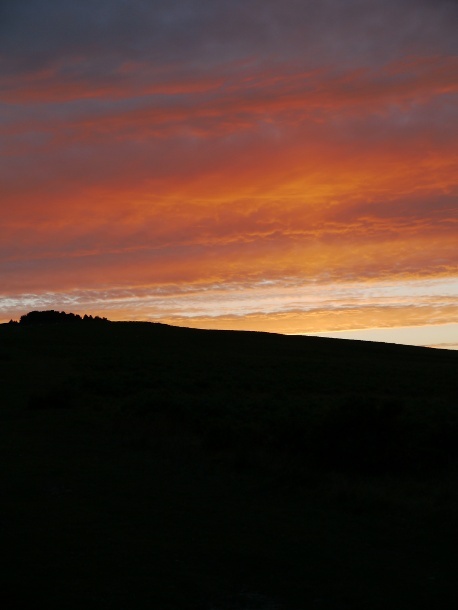 However the show was not over and the sky caught fire once more, turning yellow then orange and finally a deep red. Magical. I got back to the Bongo a happy man. I had picked a truly peaceful spot and I was not aware of any vehicles passing in the night.